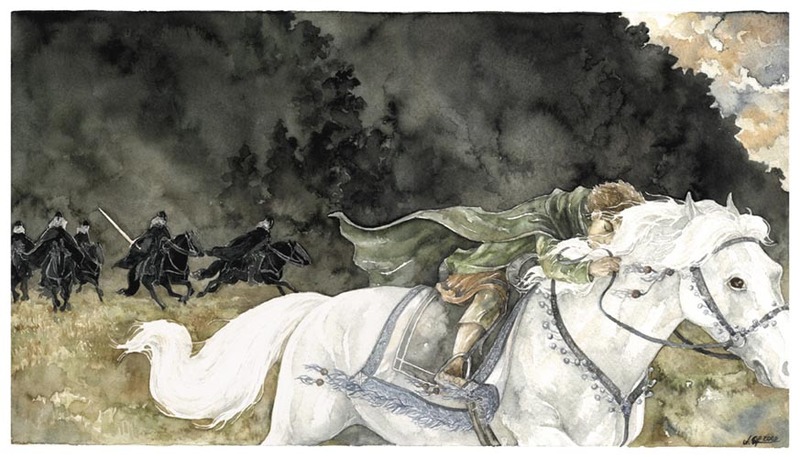 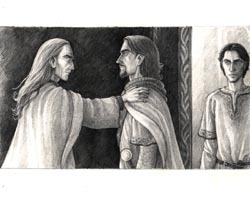 The drawings mostly show one of my favourite characters from Lord of the Rings, Faramir. 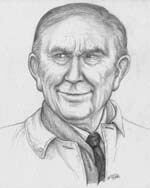 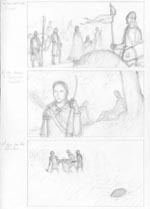 Most drawings and sketches are in pencil. 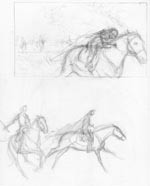 The sketches are examples of composition- and character-sketches, which often serve as a kind of creative brainstorming. 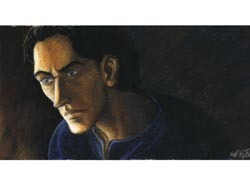 Some of them are linked to the respective painting they evolved into. 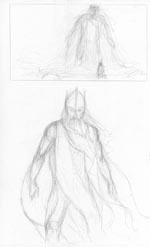 Those interested in seeing how I create a painting from the first sketches to the finished piece, there is a MAKING OF available. Cover illustration for the second volume of the Brothers of Gondor zine containing fanfiction featuring Denethor's sons. 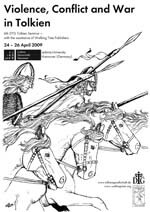 It can be downloaded in various formats here. 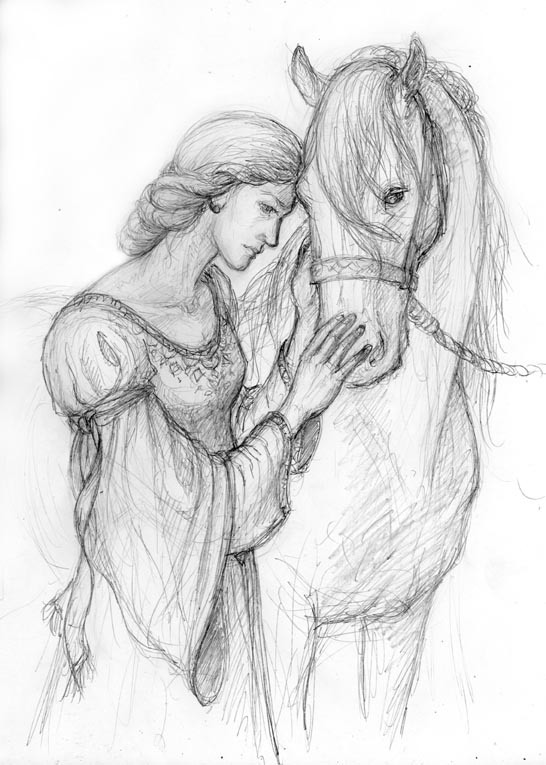 The drawing was done in coloured pencils (2011). 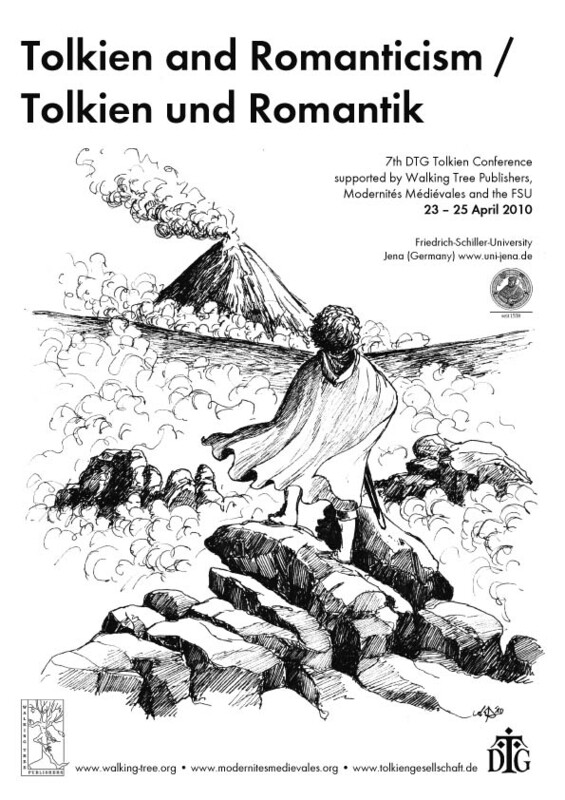 The 2010 seminar organised by the German Tolkien Society and Walking Tree Publishers deals with "Tolkien and Romanticism". 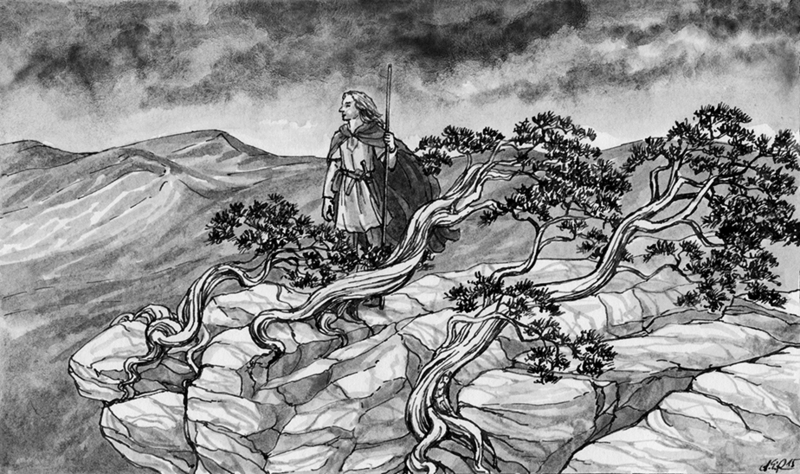 For the illustration, I "quoted" a painting by German Romantic artist Caspar David Friedrich entitled "Wanderer above the Sea of Fog" (1817/18), altering it a little to give it a Tolkienean touch. 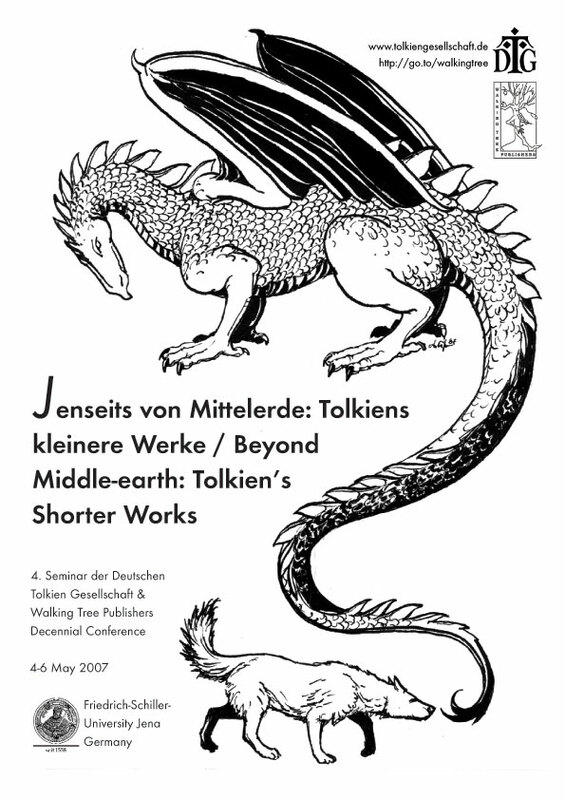 The 2009 seminar organised by the German Tolkien Society and Walking Tree Publishers deals with "Violence, Conflict and War in Tolkien". 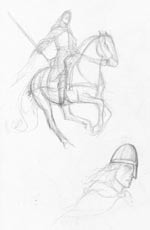 Instead of drawing a fierce battle or a heap of bodies, I decided to show a less bloody scene: Rohirrim charging the enemy. 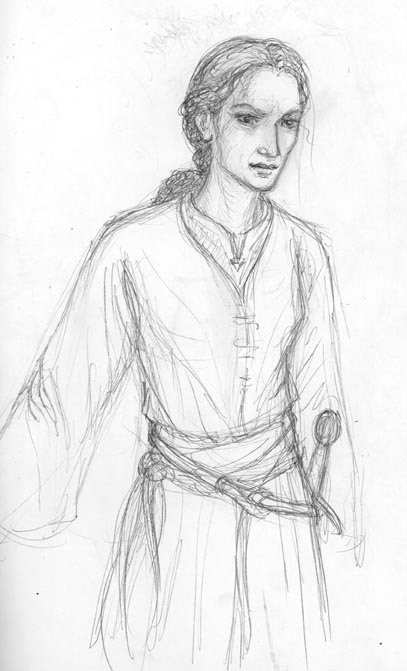 Faramir in disguise. 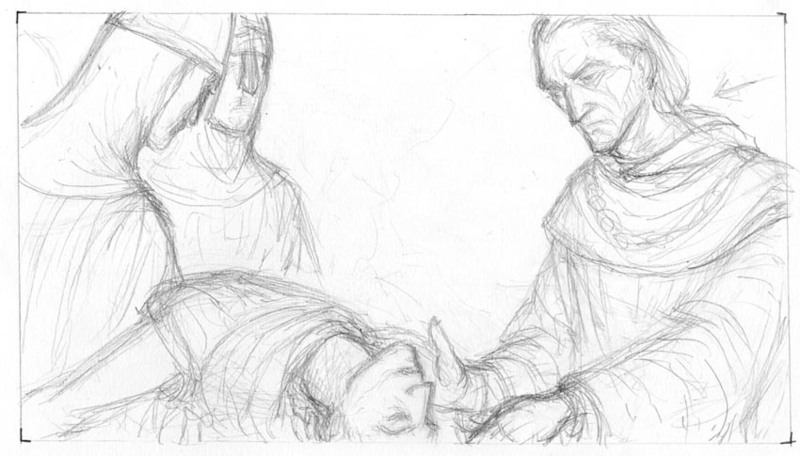 And yes, he is not too happy about it. 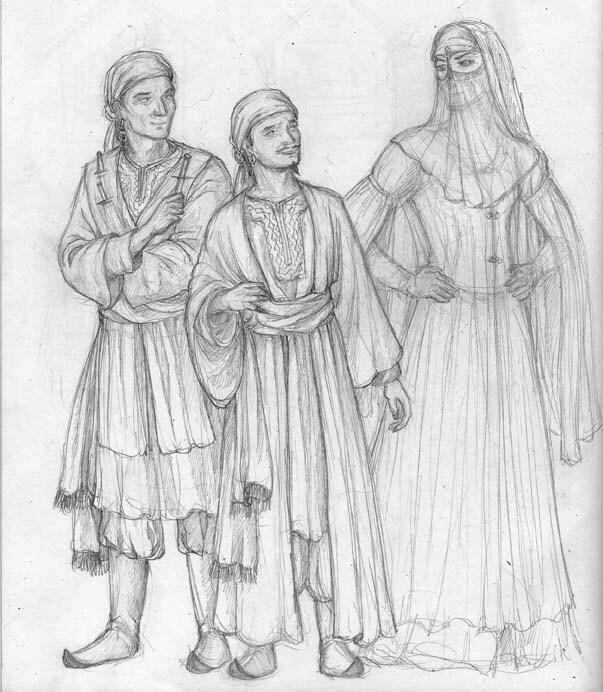 The two ladies in the first image are Narejde and Hanîje, and the two gentlemen in the second Mezlâr and Lôkhî. 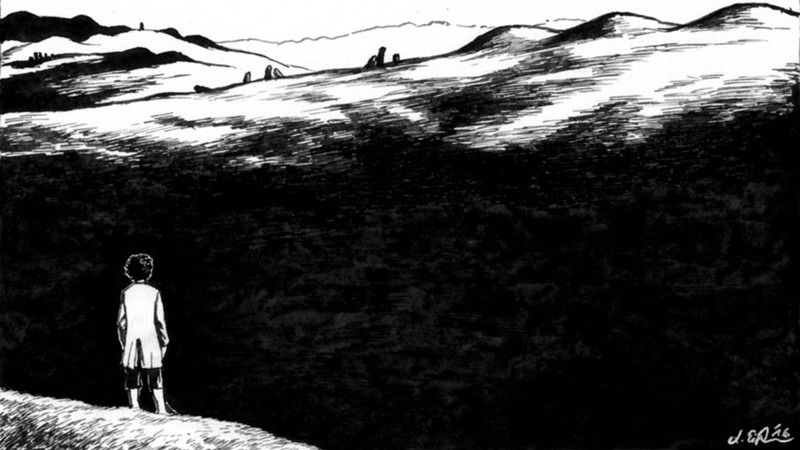 From The Snake's Checkmate. New artwork inspired by The Snake's Checkmate. 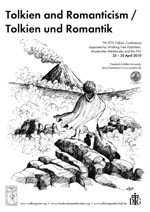 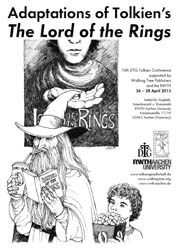 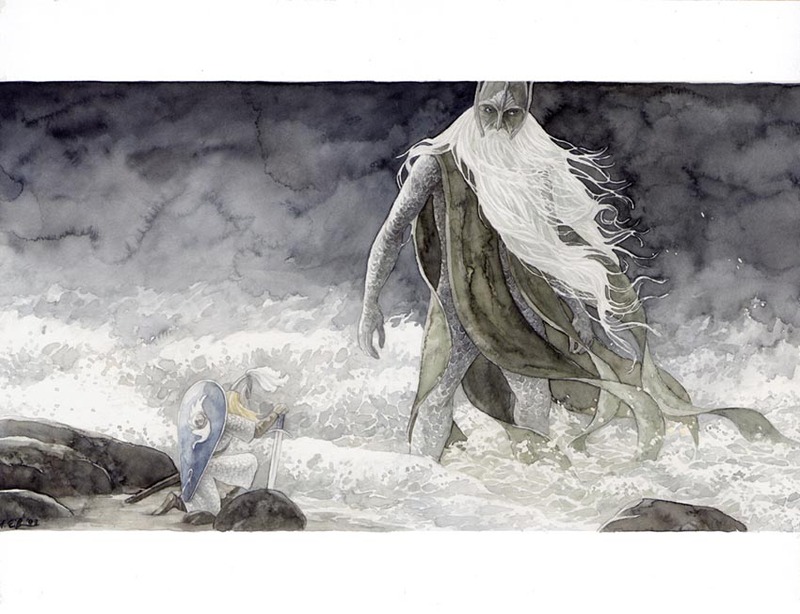 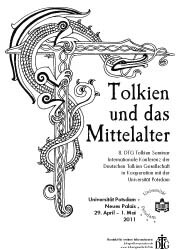 The 5th Tolkien Seminar of the German Tolkien Society looks at The Hobbit. 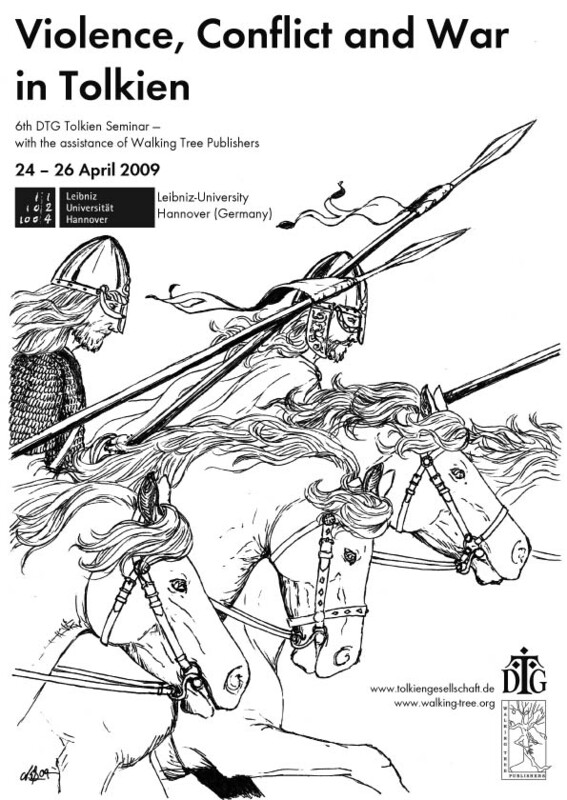 Like in 2007, I created the poster. 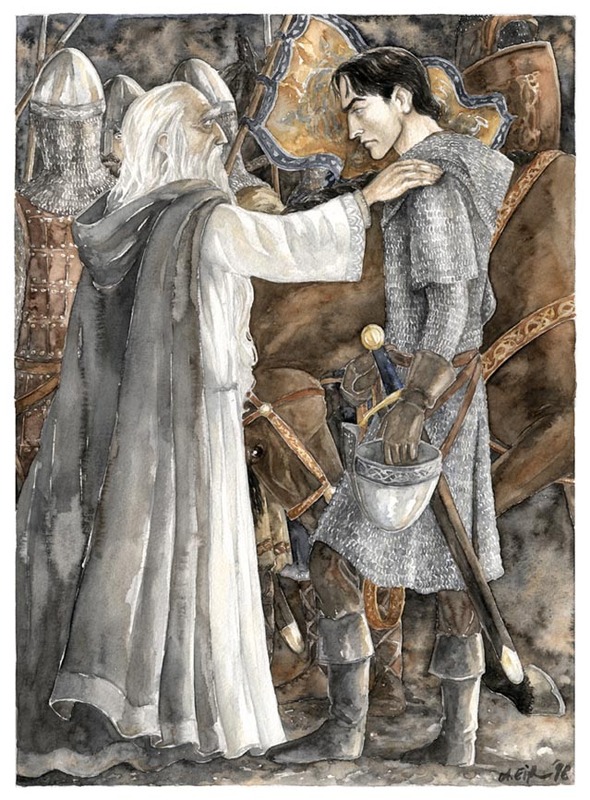 This time, it shows Gandalf leaving Bag End after marking Bilbo's door for the dwarves. 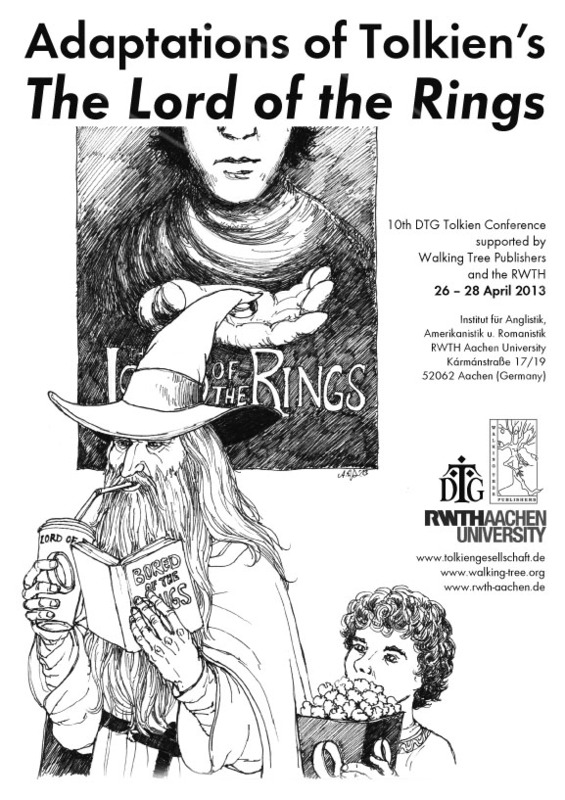 More information about the conference (most of the talks of which are in English) can be found here. 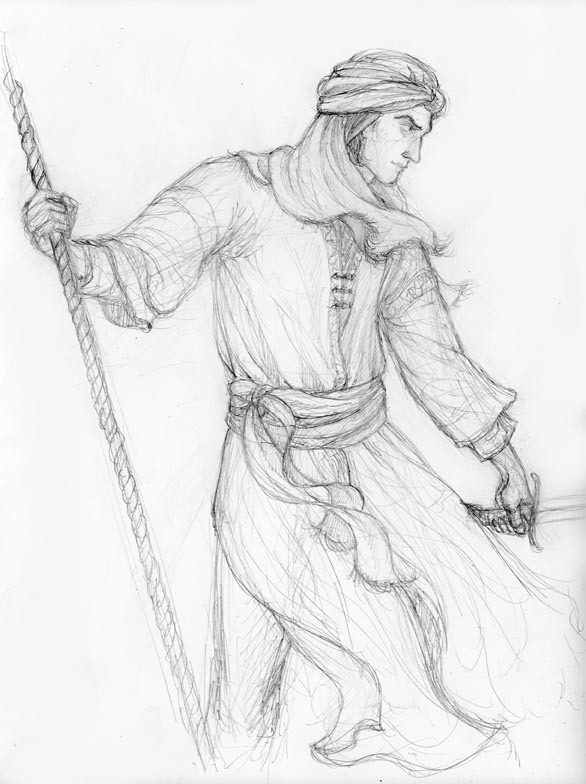 More artwork inspired by The Snake's Checkmate. 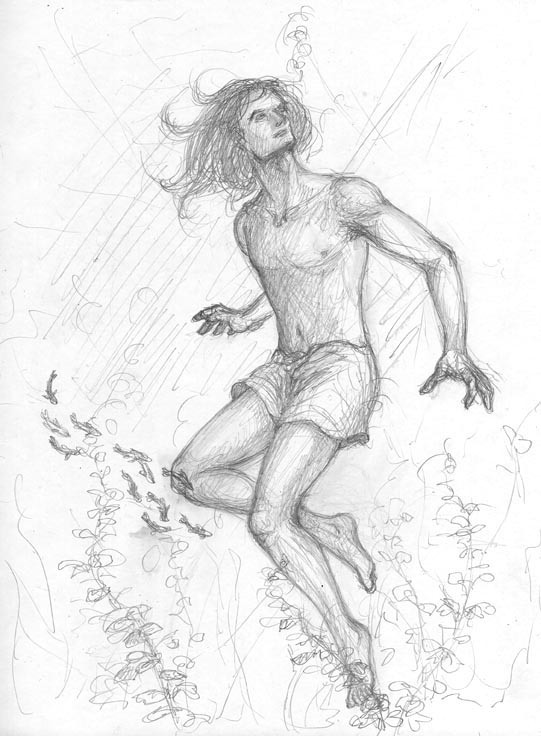 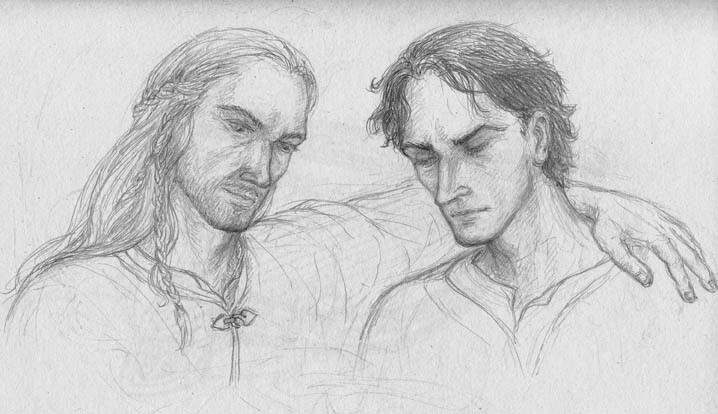 After an encounter with Al-Jahmîr himself, Faramir cools his anger by taking a swim in the lake, and afterwards getting rid of his "hair-extensions". 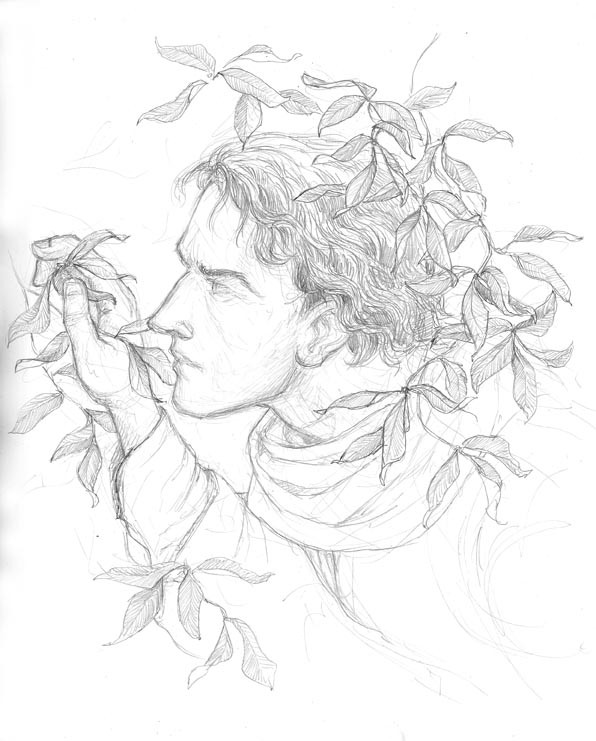 New artwork inspired by The Snake's Checkmate. 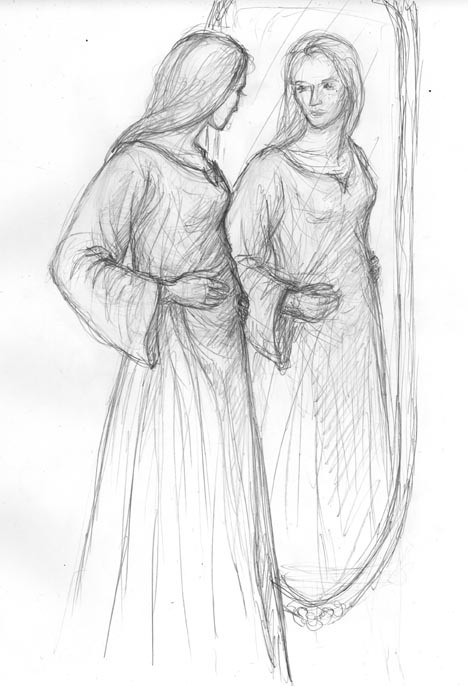 Éowyn and Faramir have finally managed to meet again, if only for a short while. 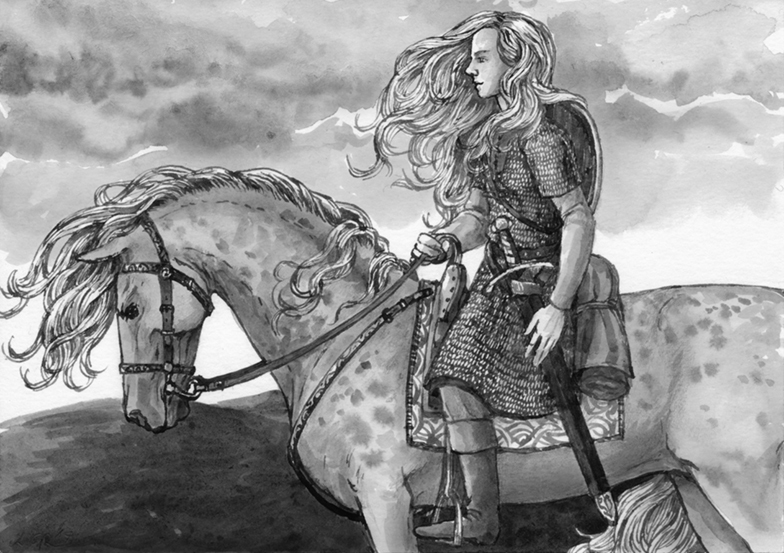 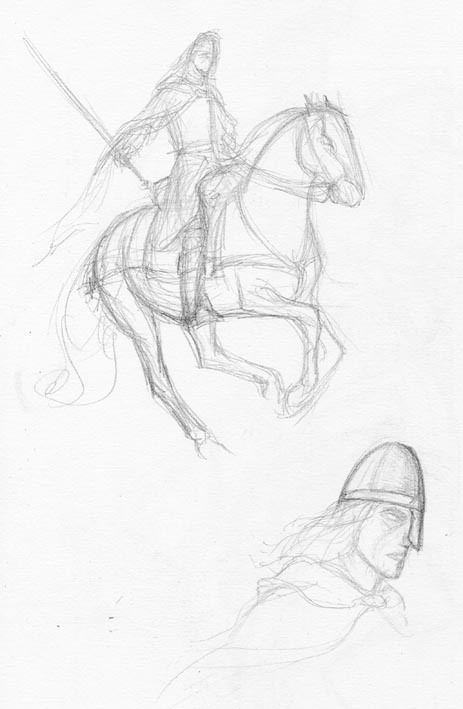 Since my co-author Lady of Rohan complained about me only drawing pictures of Faramir inspired by our fanfiction, here are a few sketches of Éowyn in various scenes from The Snake's Checkmate. 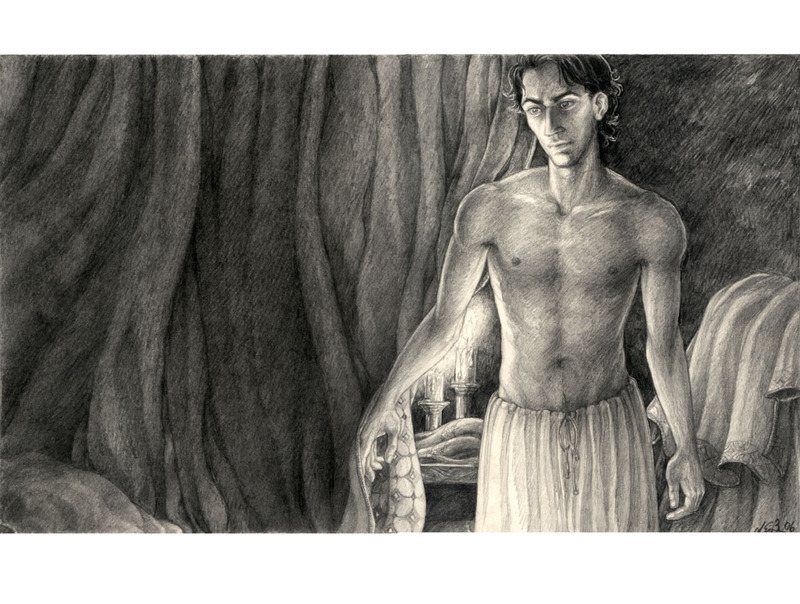 The scene with bad guy Al-Jahmîr behind her is even creepier in the story. 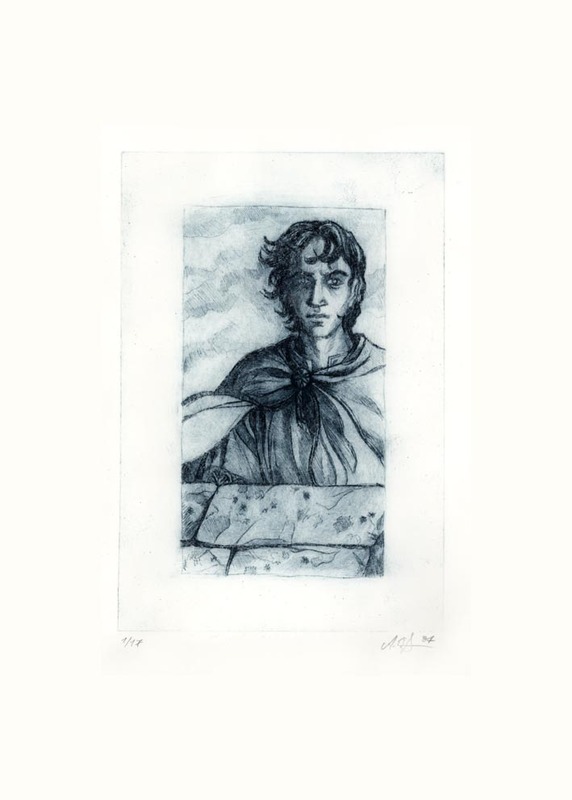 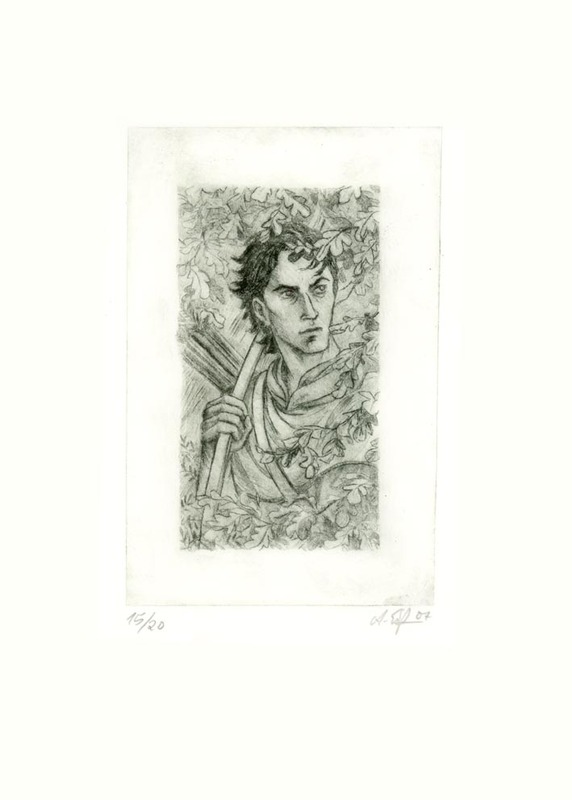 Another etching of Faramir (a rather young one) with the preparatory pencil-sketch and a scan of the actual etching plate, out of a series of 17. 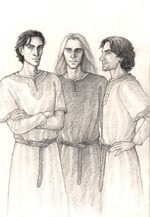 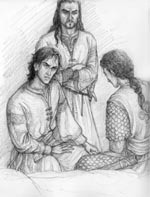 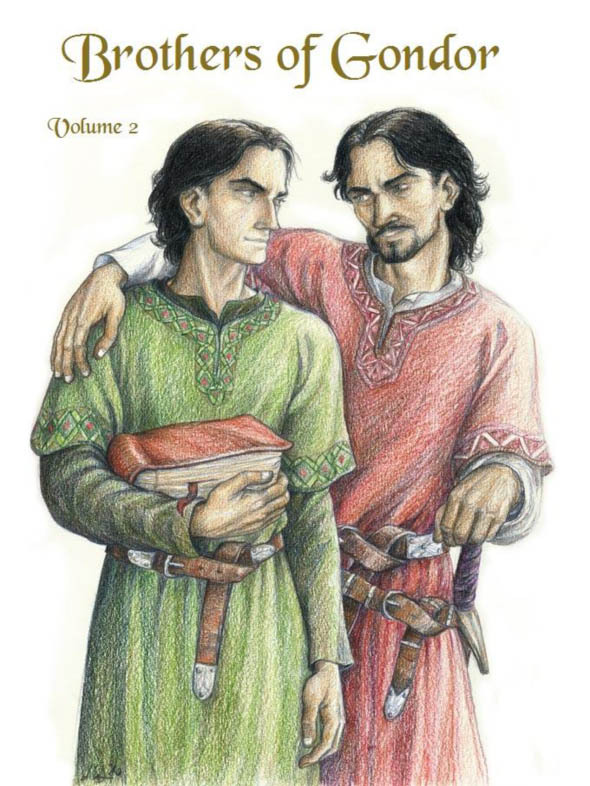 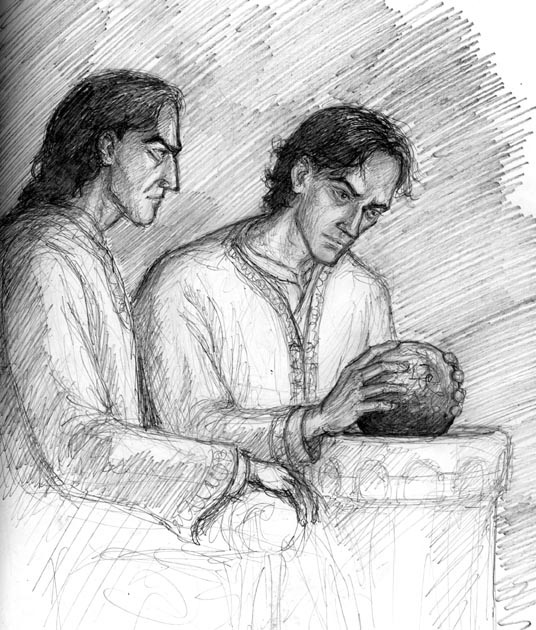 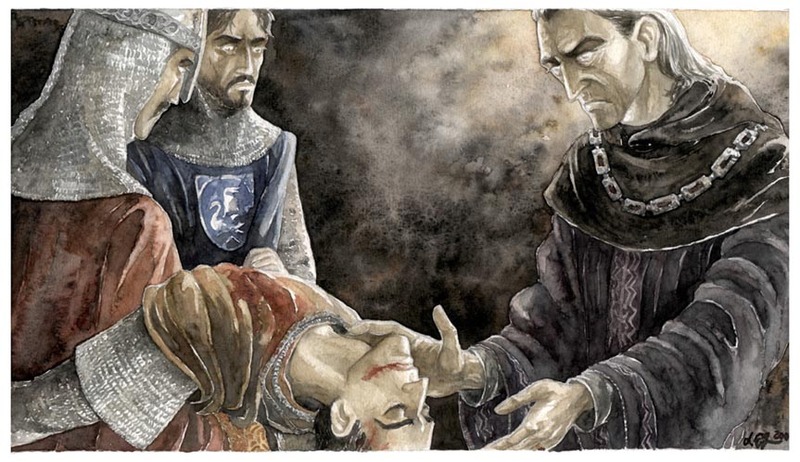 Faramir and Khorazîr are interrogating an Umbarian prisoner who has interesting things to tell. 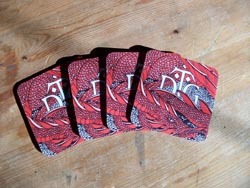 From The Snake's Checkmate. 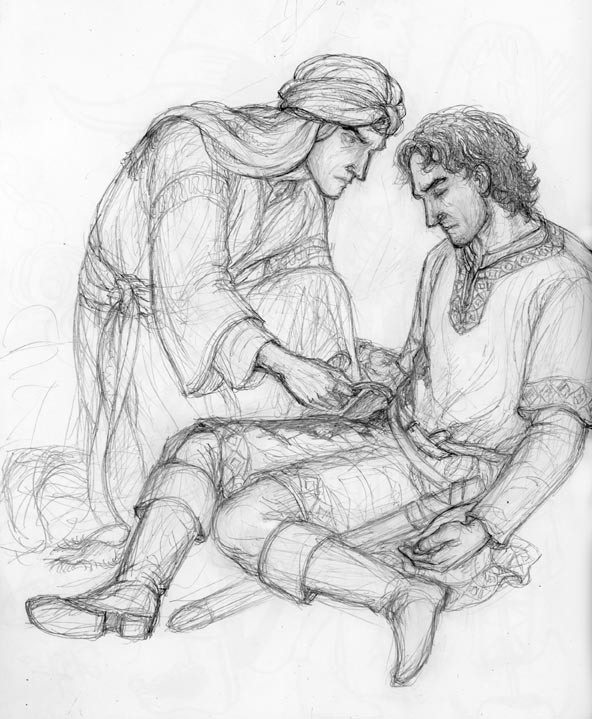 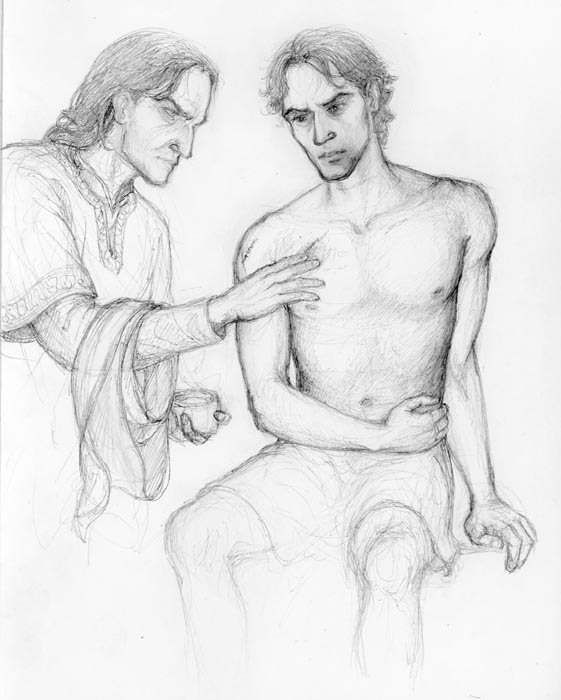 Wounded during battle on the corsair-ship while guarding his captain Faramir, the Ranger Dorgil (actually the healer of the company) is in need of treatment, so Faramir tends to him. 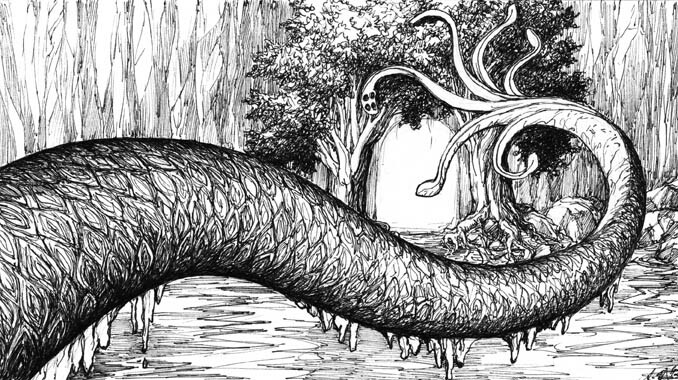 From The Snake's Checkmate. 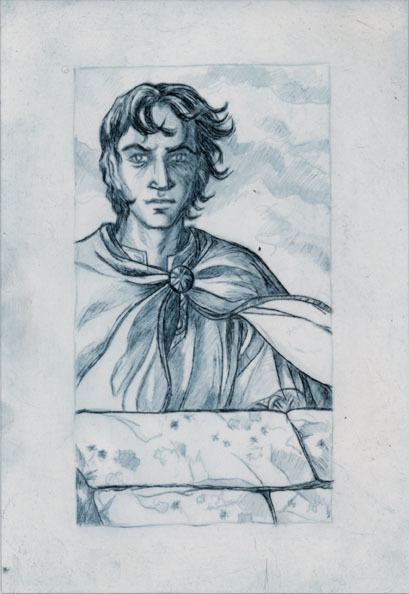 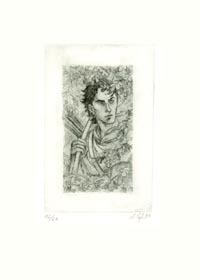 A pencil-sketch of Faramir in Ithilien, the resulting etching, and one of the prints done from the plate, out of a series of 20. Actually, this is my first etching for a very long time, but I needed to refresh my knowledge of the technique in order to teach my students properly. 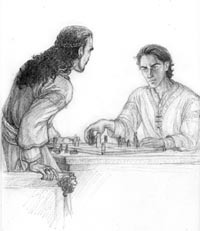 Actually a scene from an earlier fanfiction, which can be found here: Faramir playing (and winning) a game of chess against his arch-enemy Marek Al-Jahmîr. 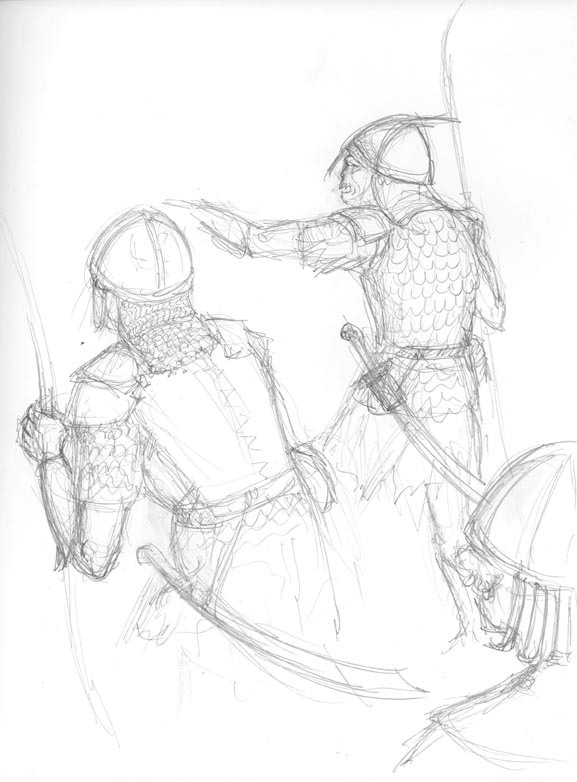 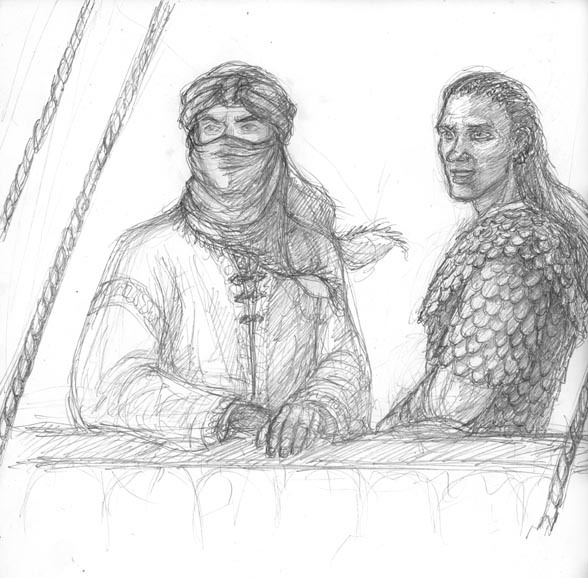 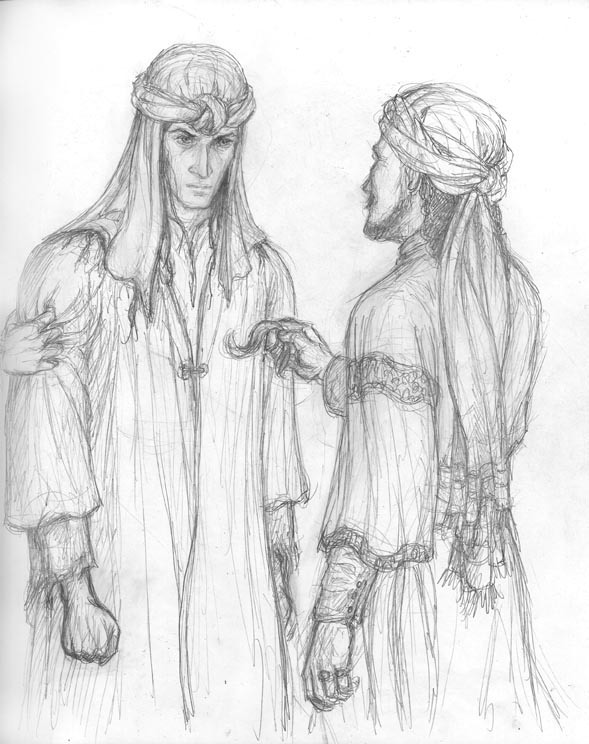 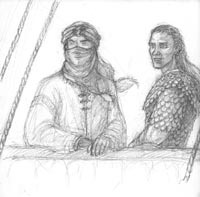 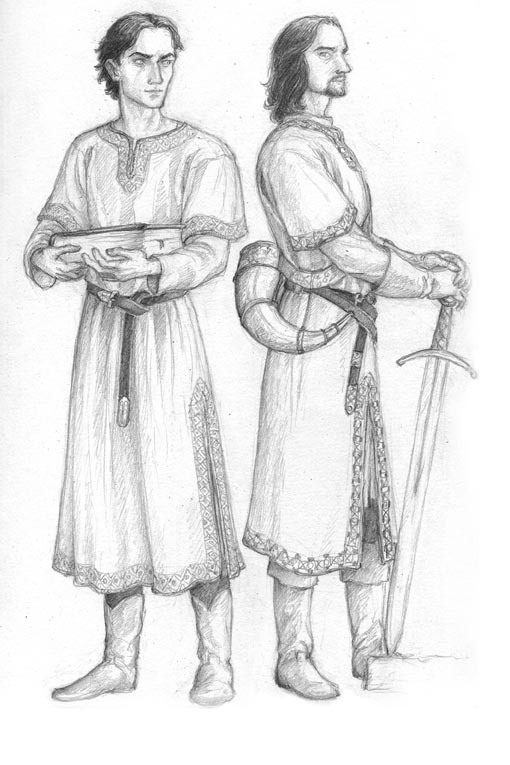 Sketches of Faramir and the corsair Azrubâr (entitled "Farewell to Gondor"), and Faramir in Haradaic garments during a sea-battle, from The Snake's Checkmate. 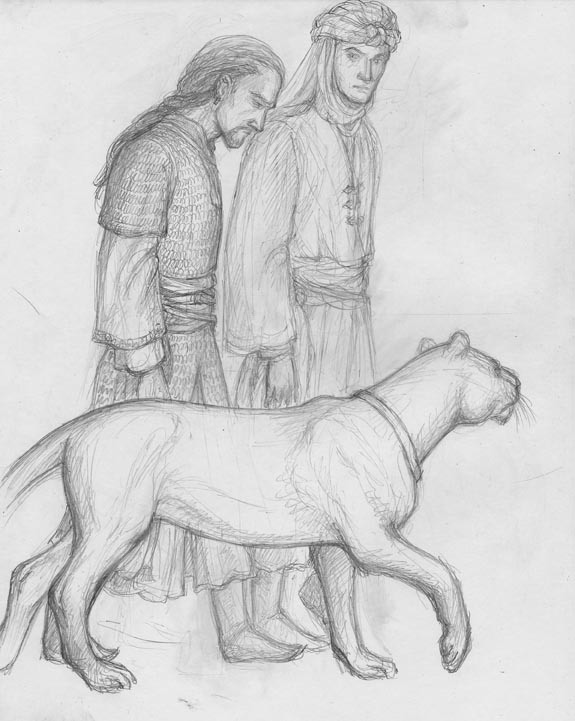 Sketches of Faramir (with his son Elboron, Éomer, King Elessar and another of his babies respectively) and the Southron Corsair Azrubâr in scenes inspired by our Fanfiction-story The Snake's Checkmate. 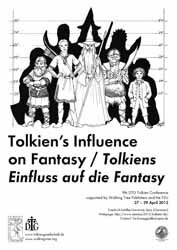 The seminar, organised by the German Tolkien Society and Walking Tree Publishers looks at Tolkien's shorter works. 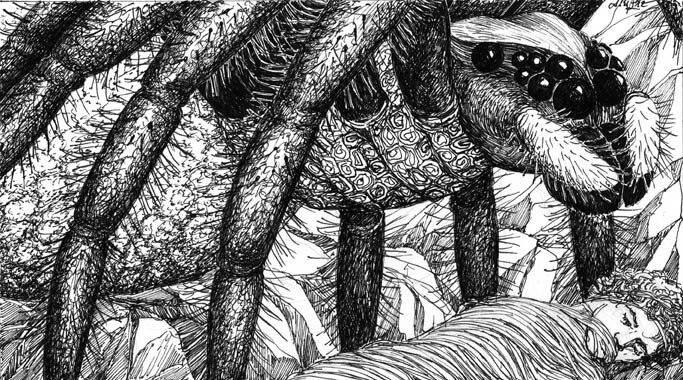 Hence my ink-drawing for the poster shows the dragon Chrysophylax and Garm the dog from Farmer Giles of Ham. 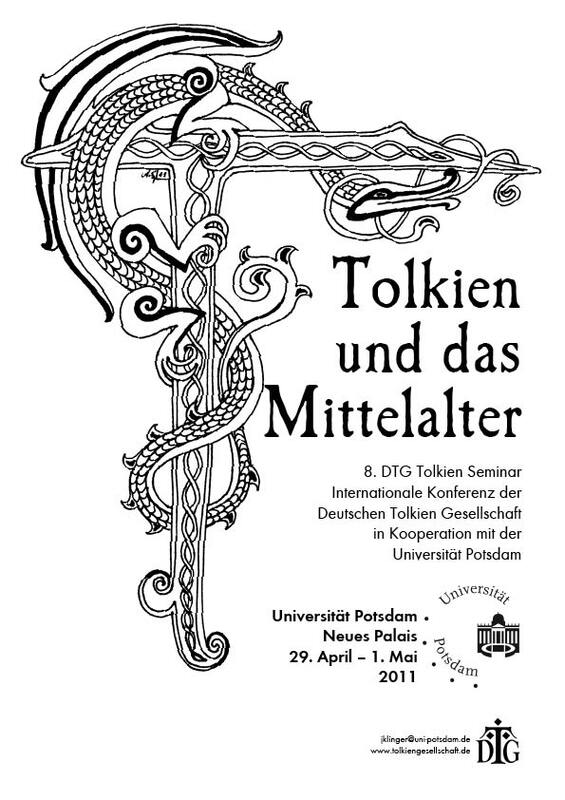 More information about the seminar can be found here. 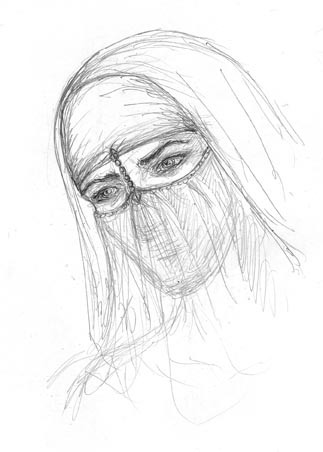 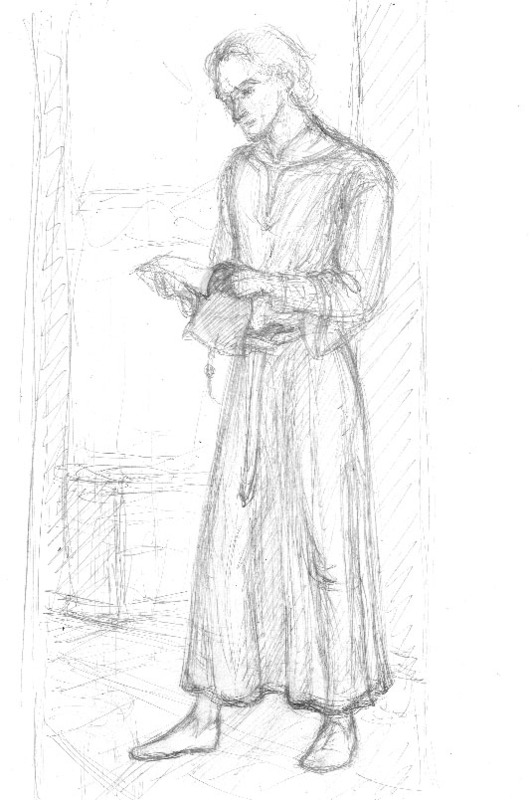 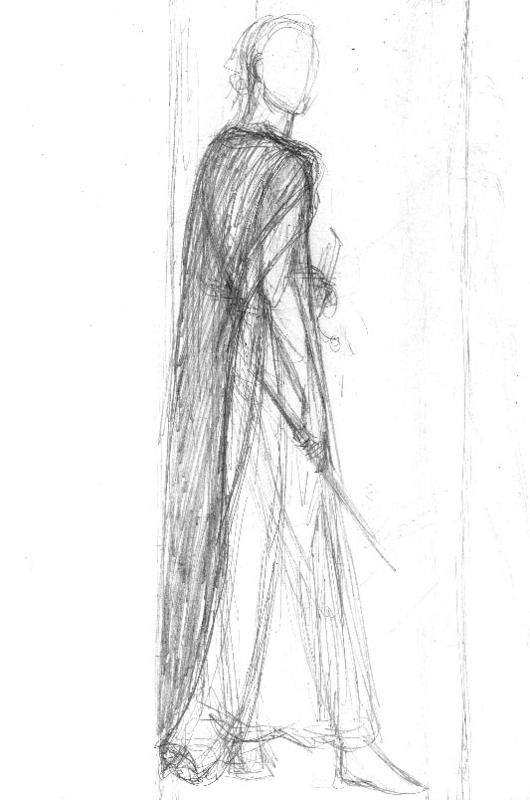 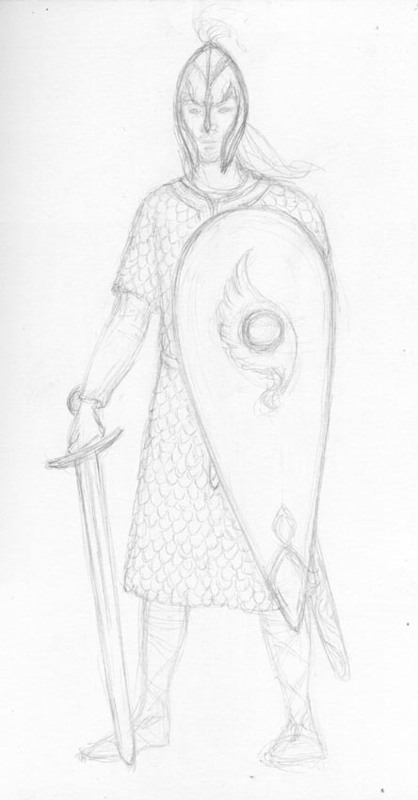 A sketch of Faramir in Haradaic gear, as described in the Fanfiction-story The Snake's Checkmate. 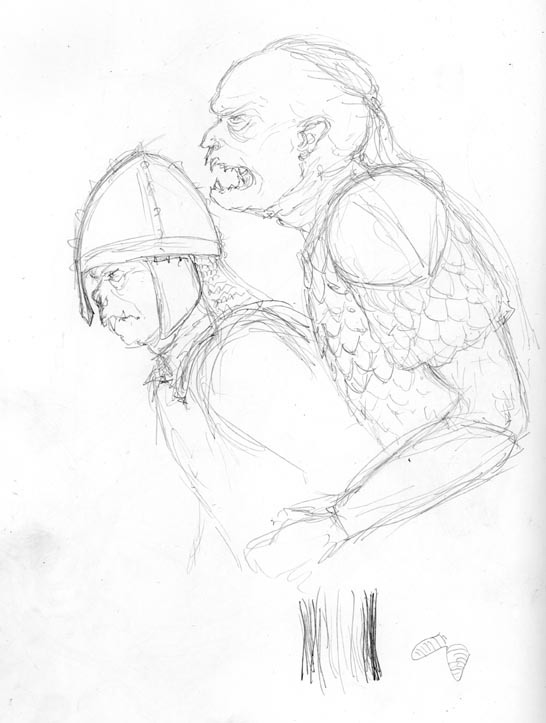 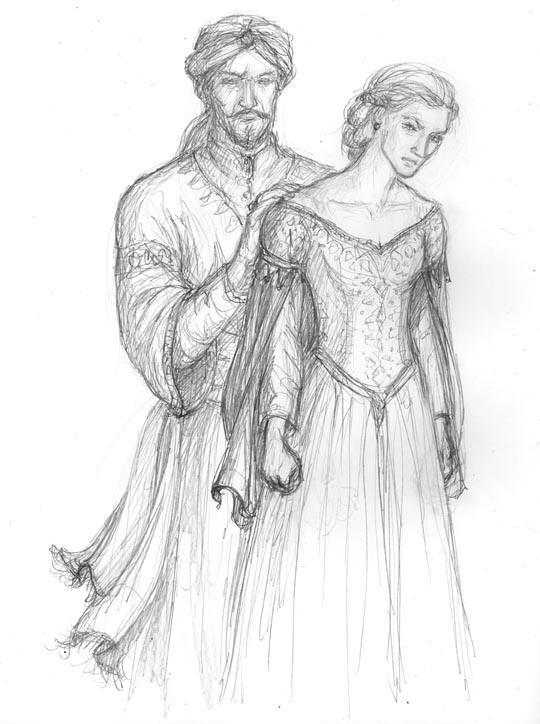 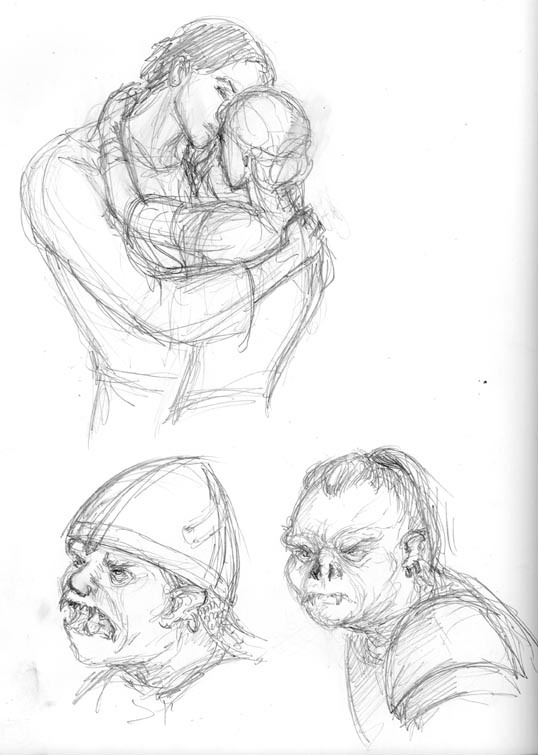 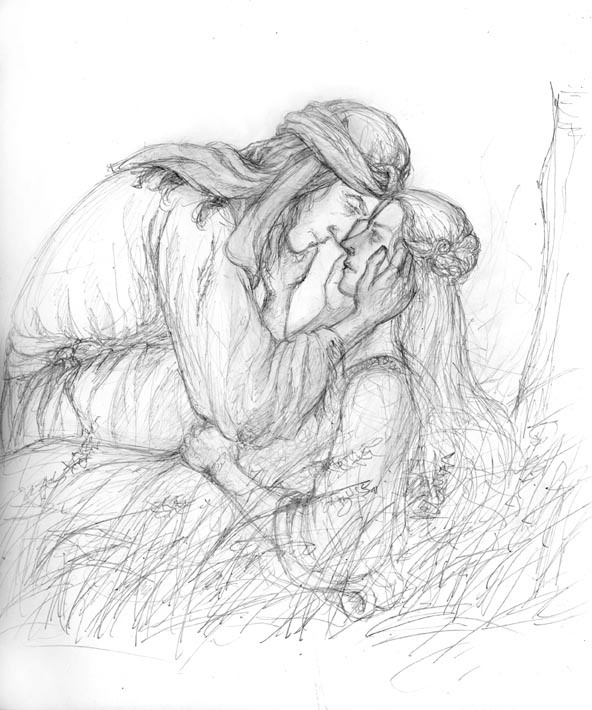 Sketches of Faramir and Éowyn, and a couple of Orcs, drawn in pencil. 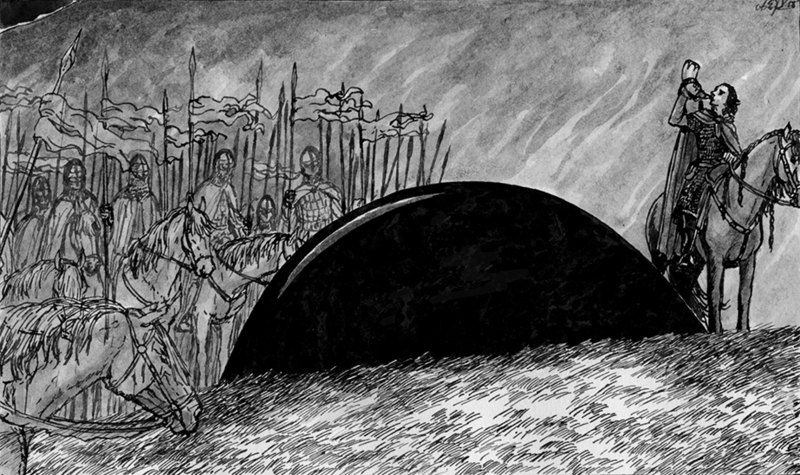 Another page from my Sketchbook; this time, the drawing is in black ink. 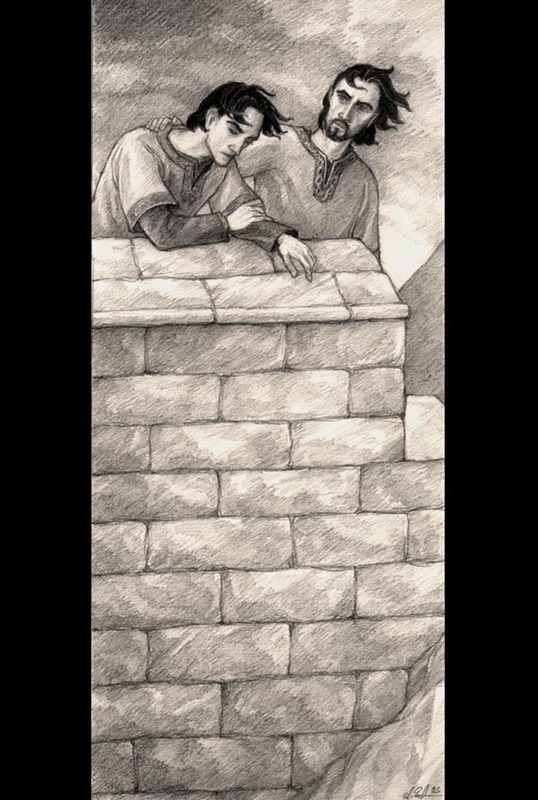 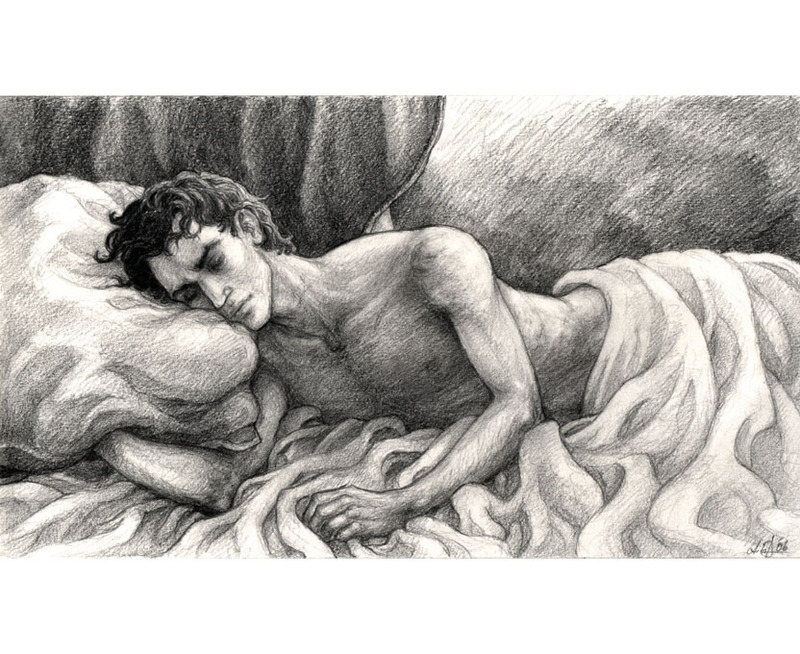 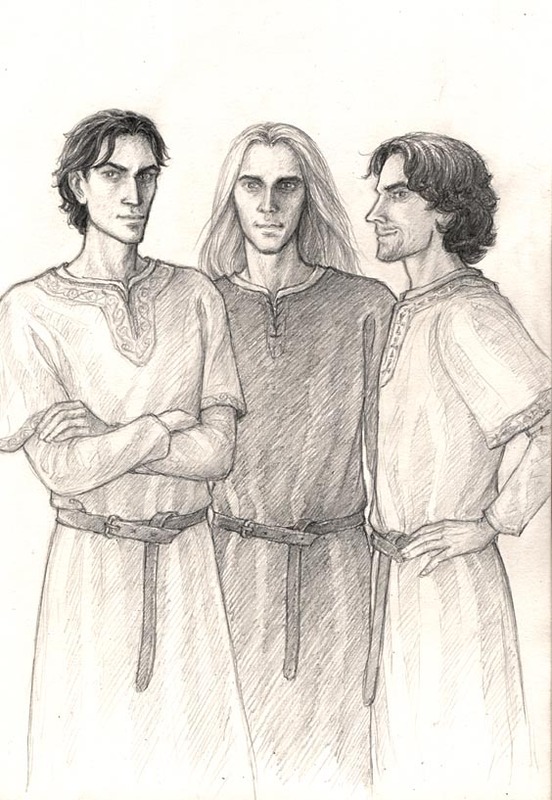 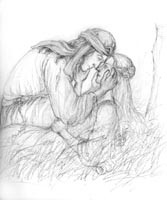 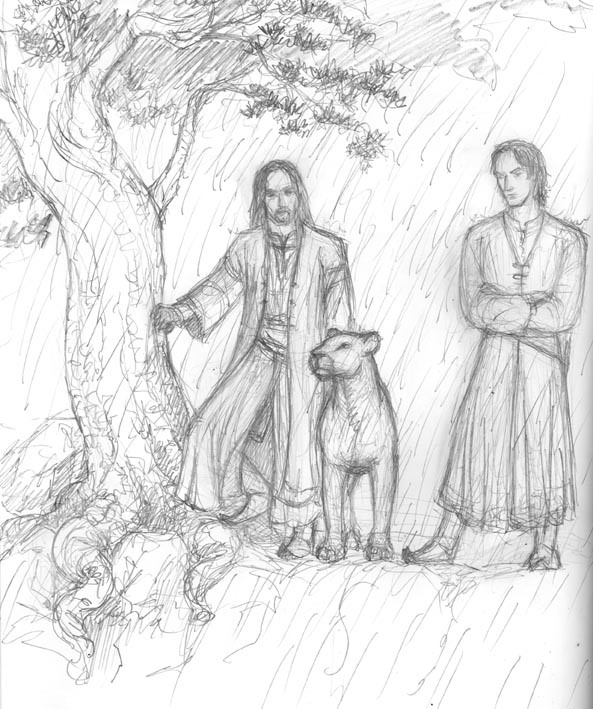 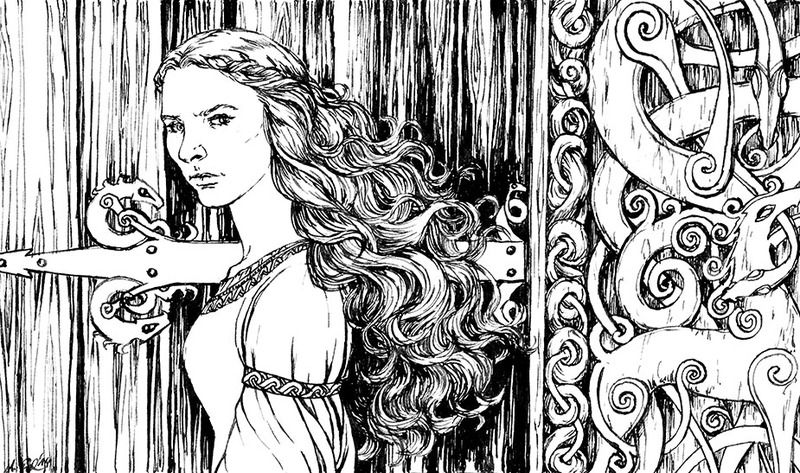 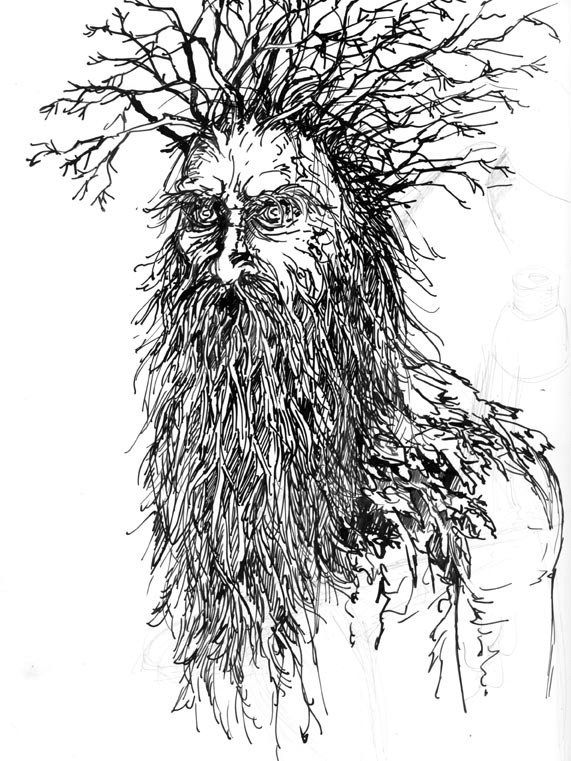 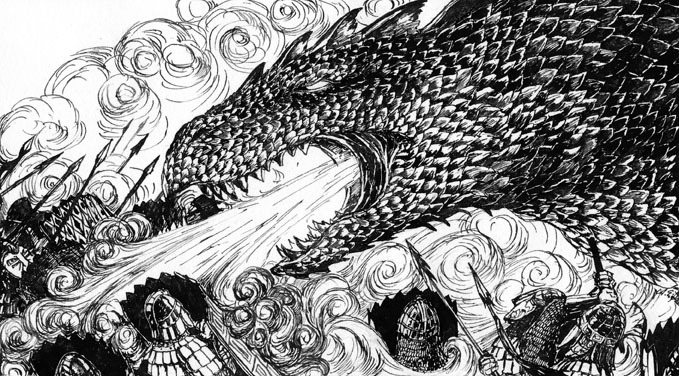 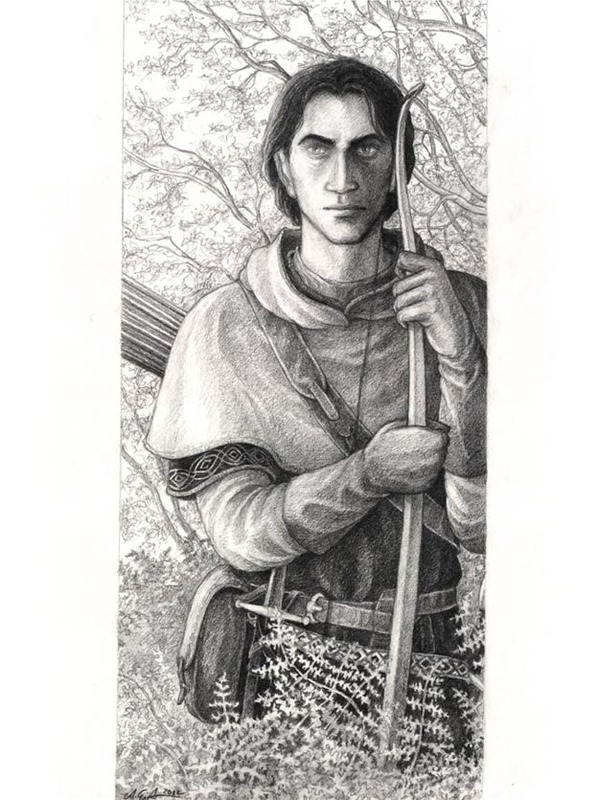 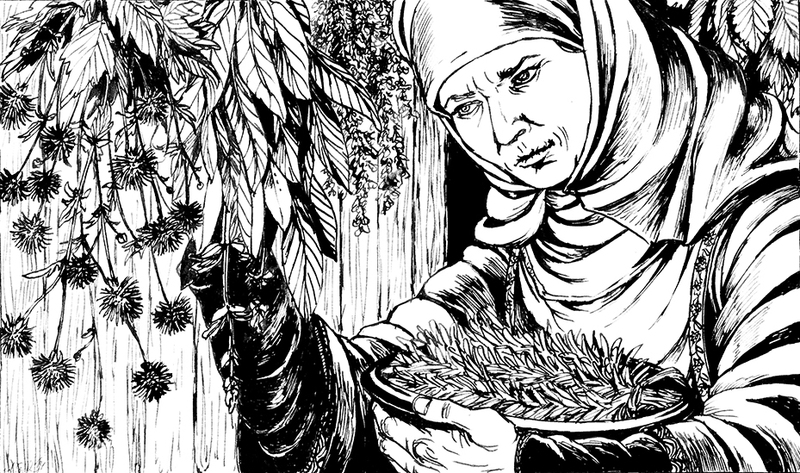 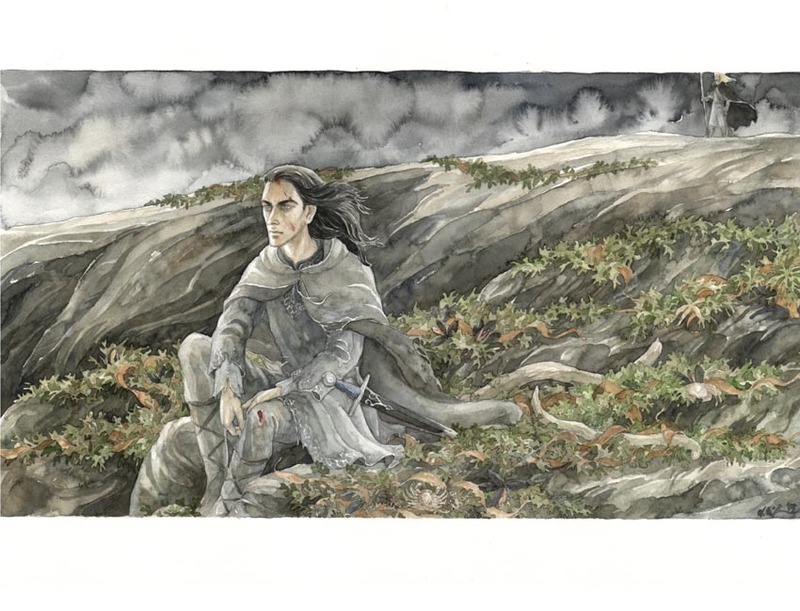 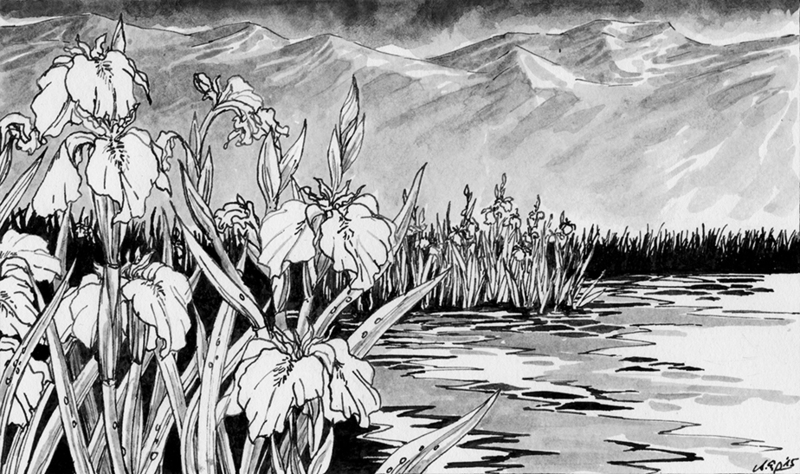 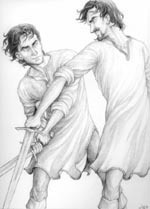 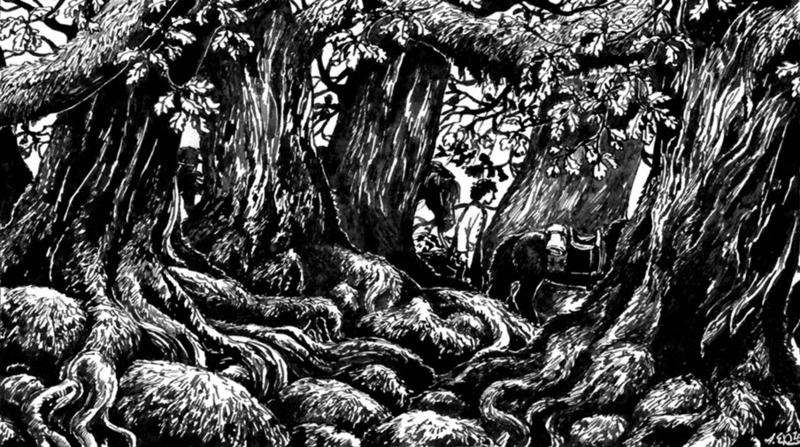 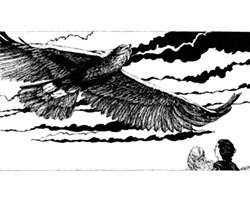 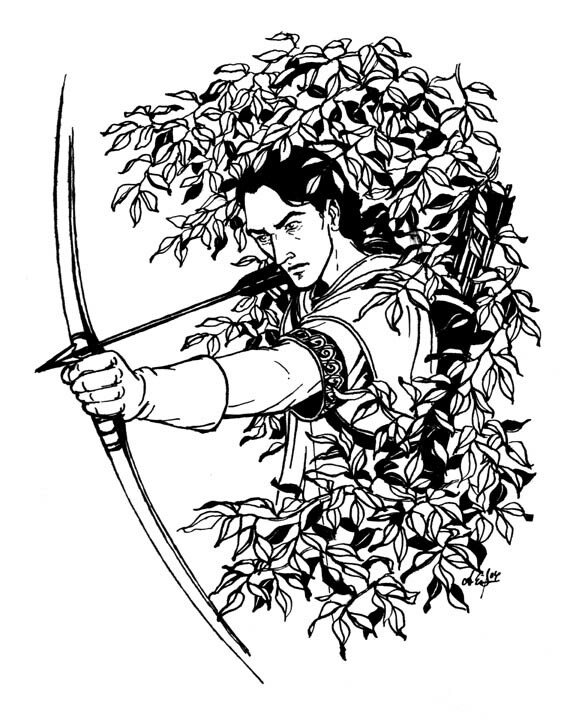 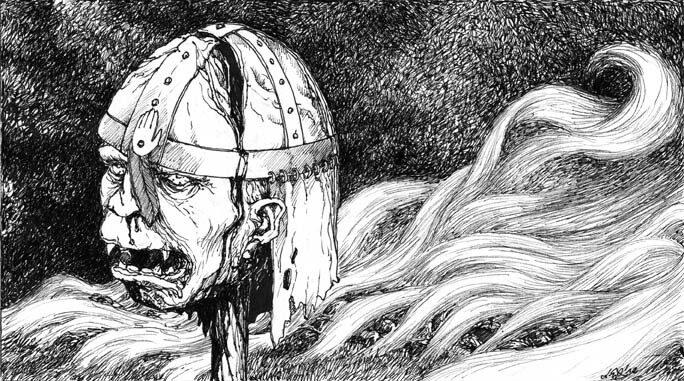 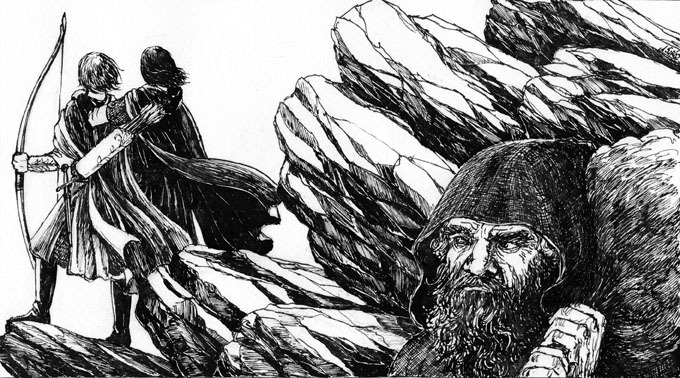 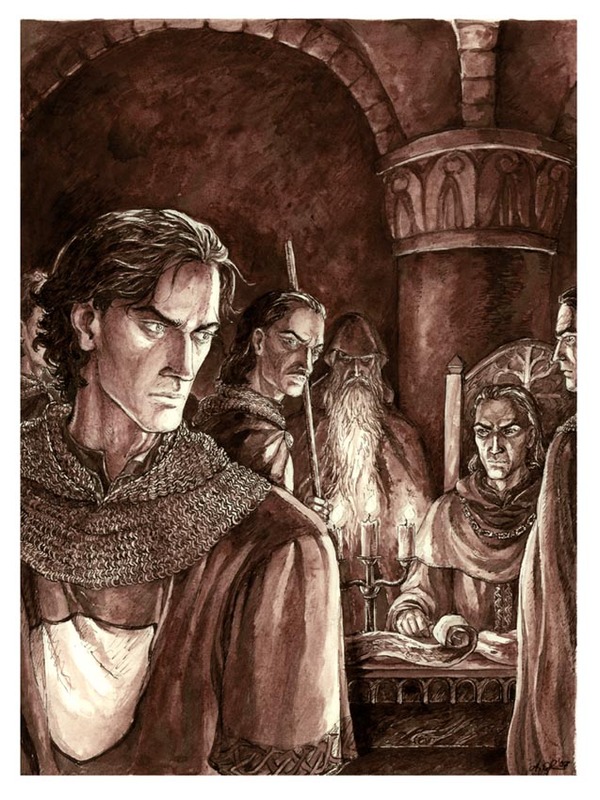 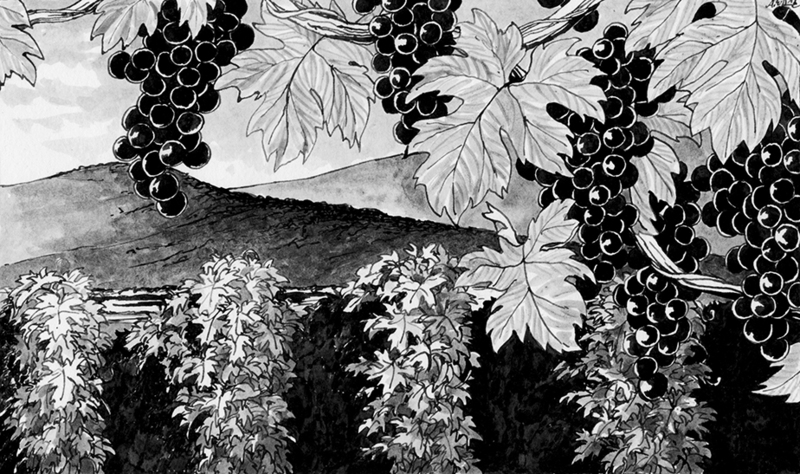 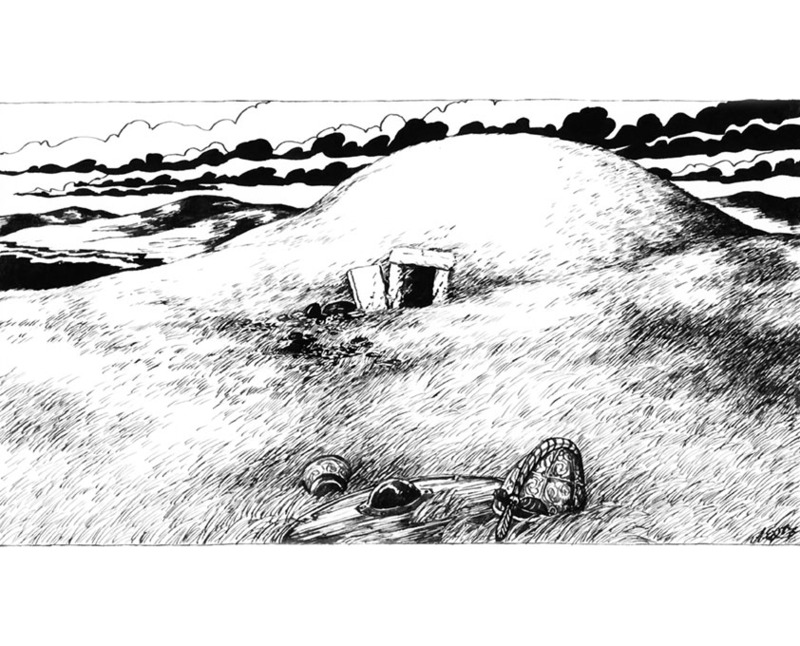 This drawing is featured as an illustration in the Brothers of Gondor-Fanzine. 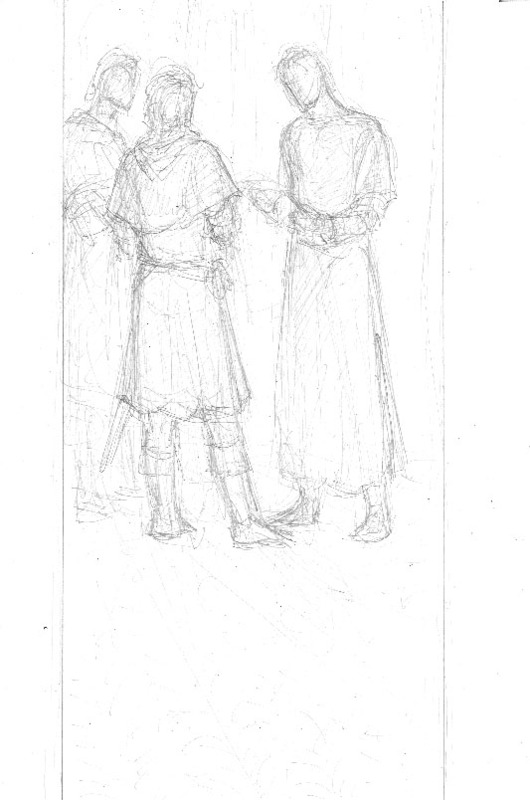 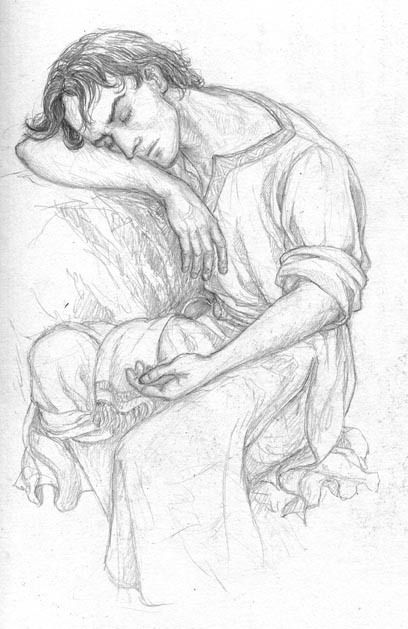 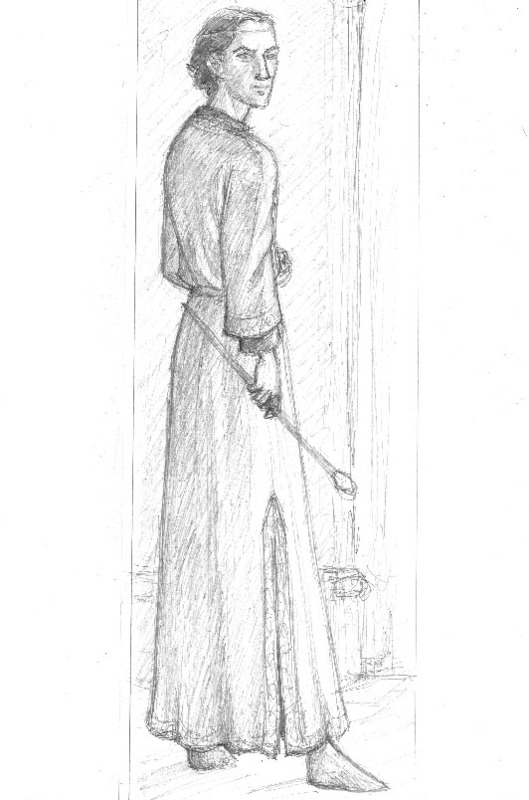 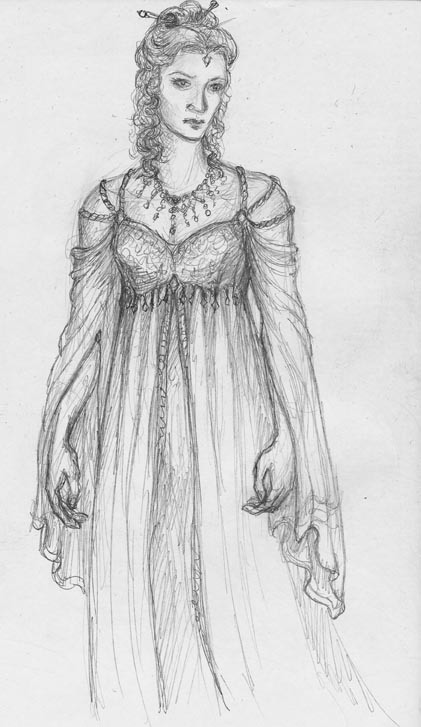 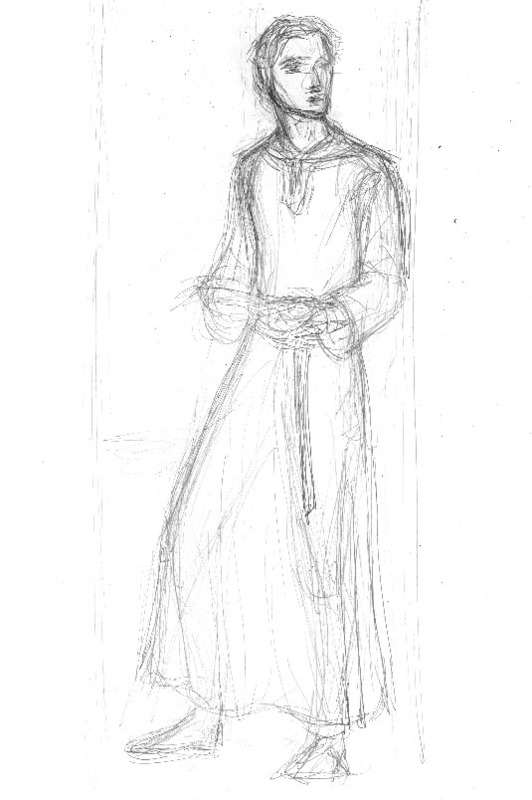 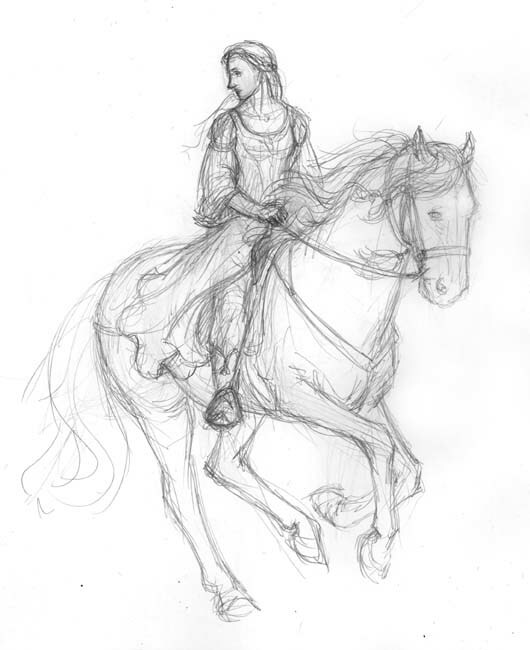 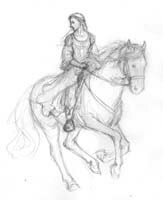 Sketches for "King's Steward". 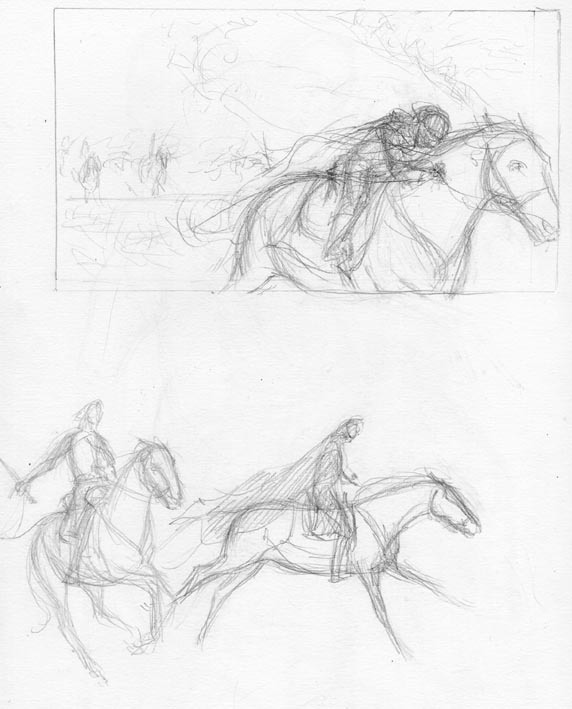 It took me some time and several drawings to decide on the right pose. 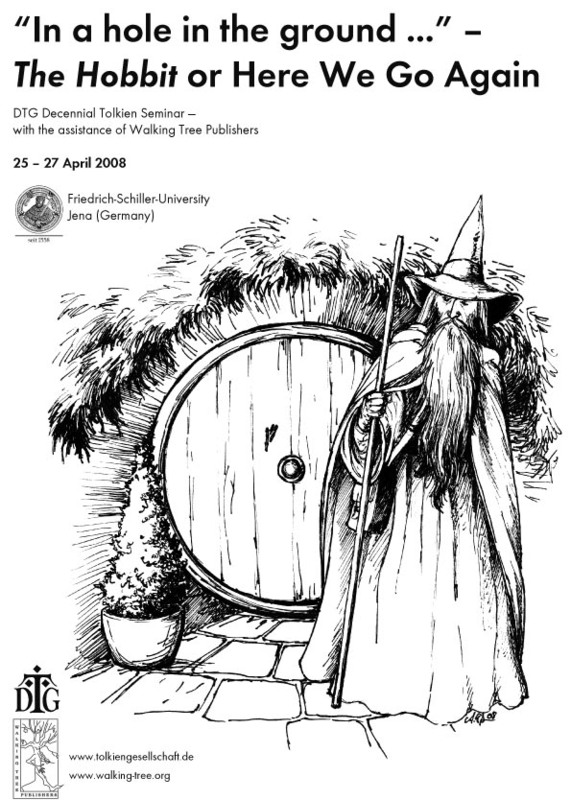 Tolkien 2005 is an international Tolkien conference that is going to be held in Birmingham, UK in August 2005. 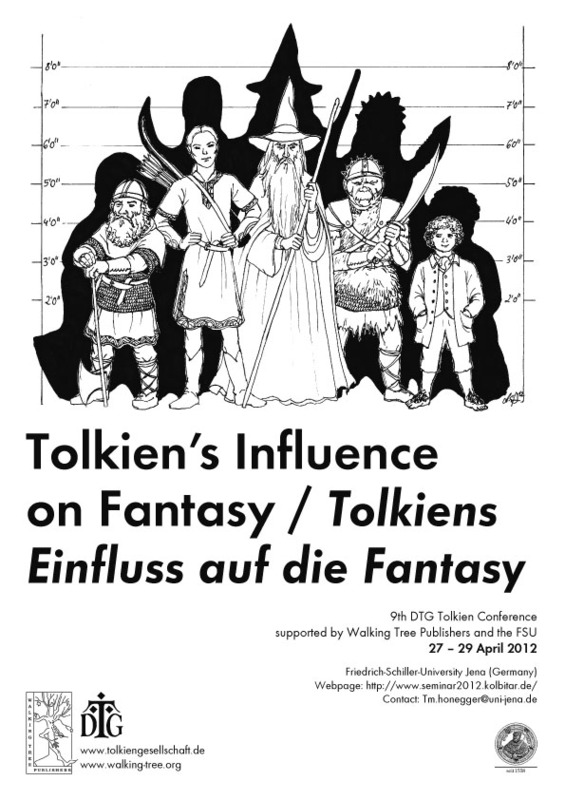 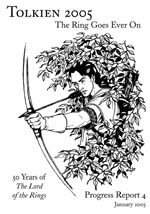 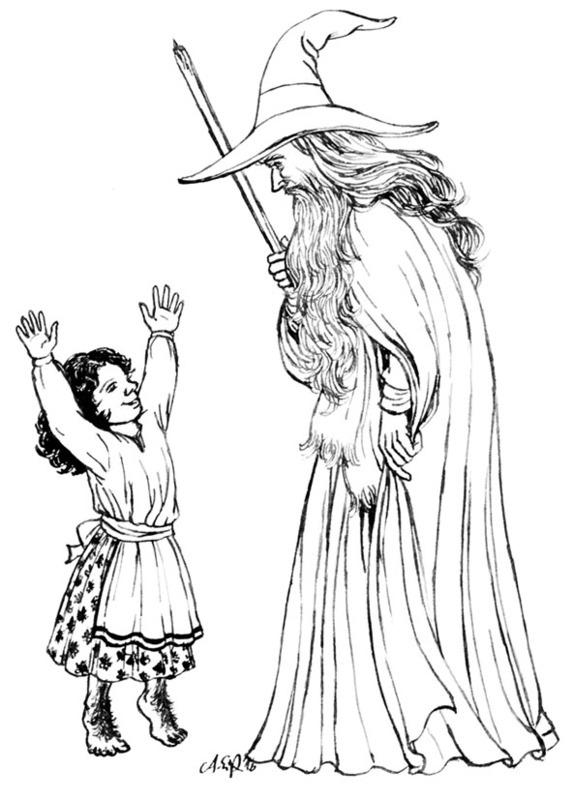 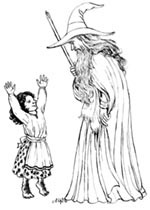 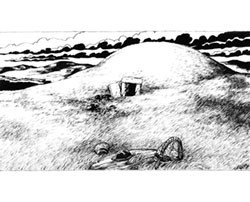 I have been invited to attend by the Tolkien Society. Also, I was asked to create a cover for the 4th Progress Report, which also features an interview with me. 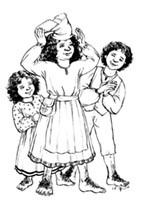 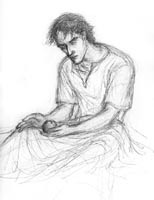 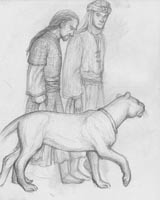 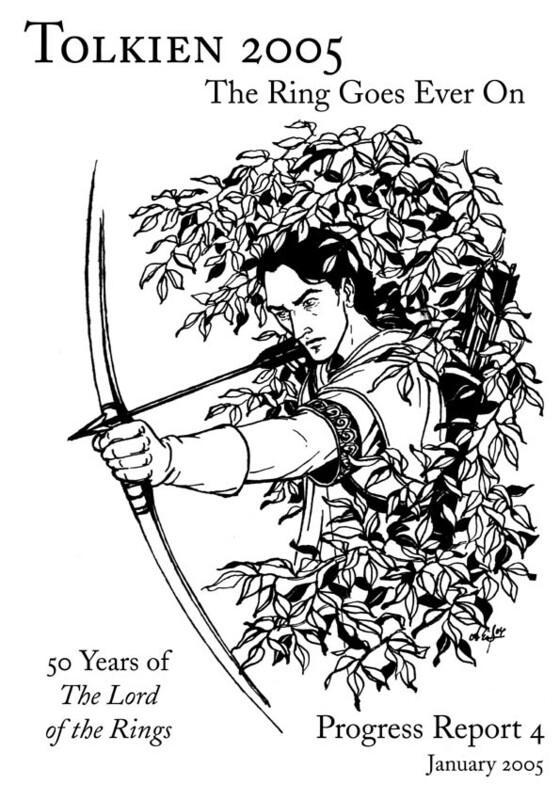 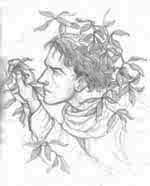 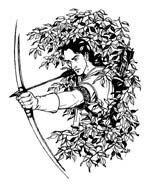 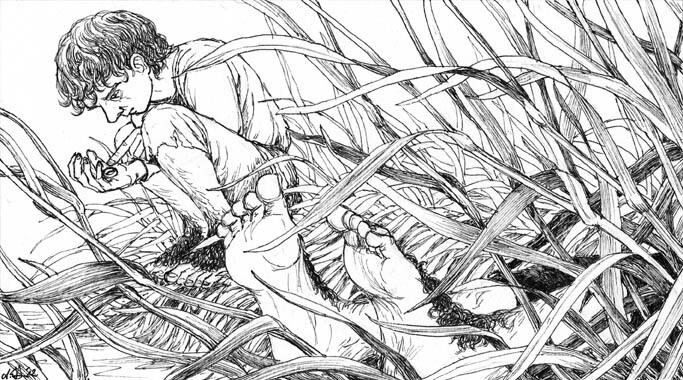 The ink-drawing shows Faramir. 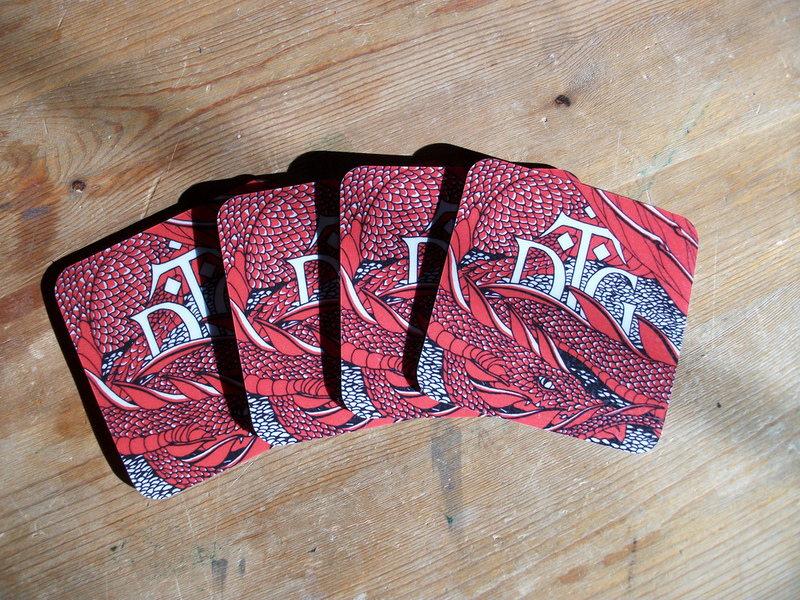 The typeface is Adobe Caslon. 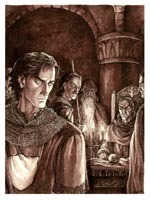 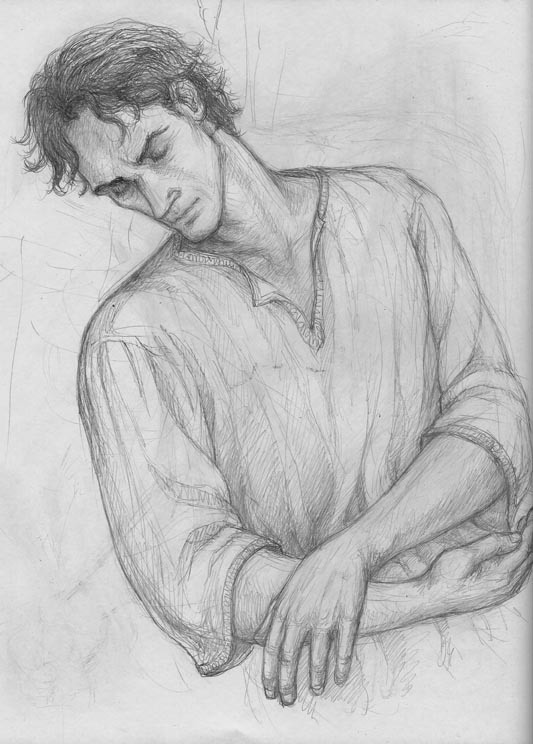 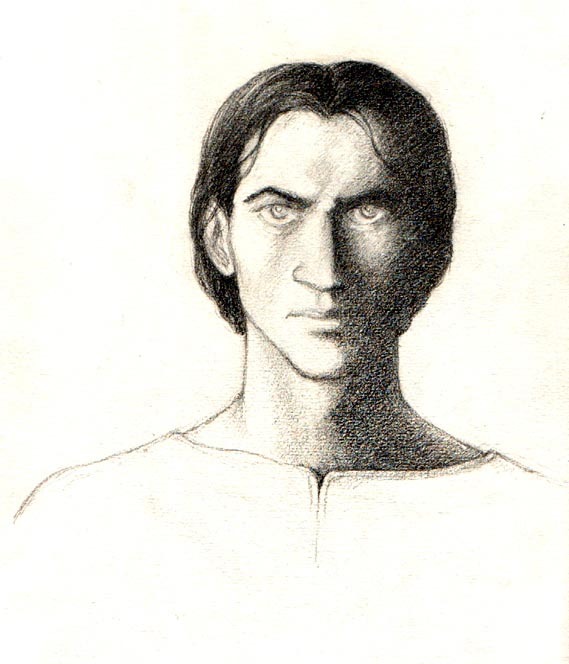 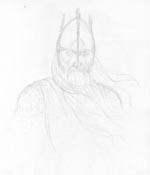 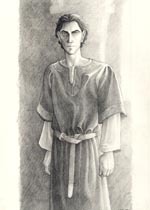 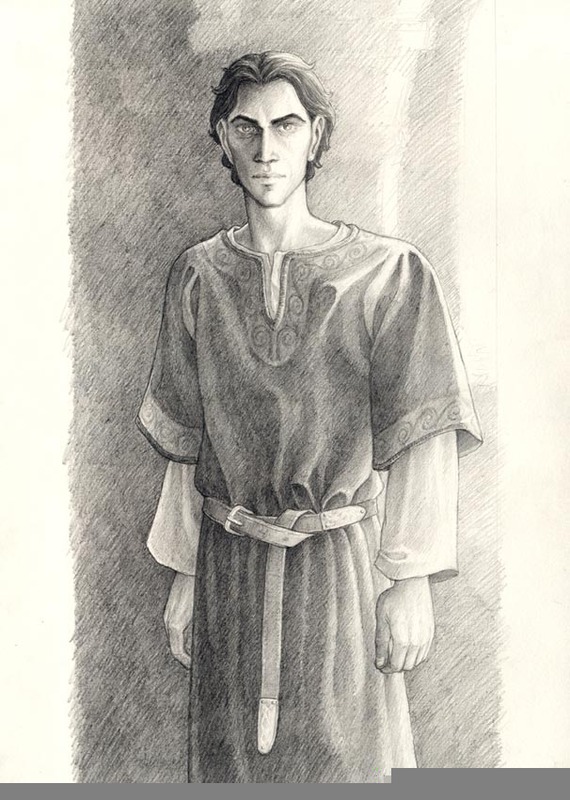 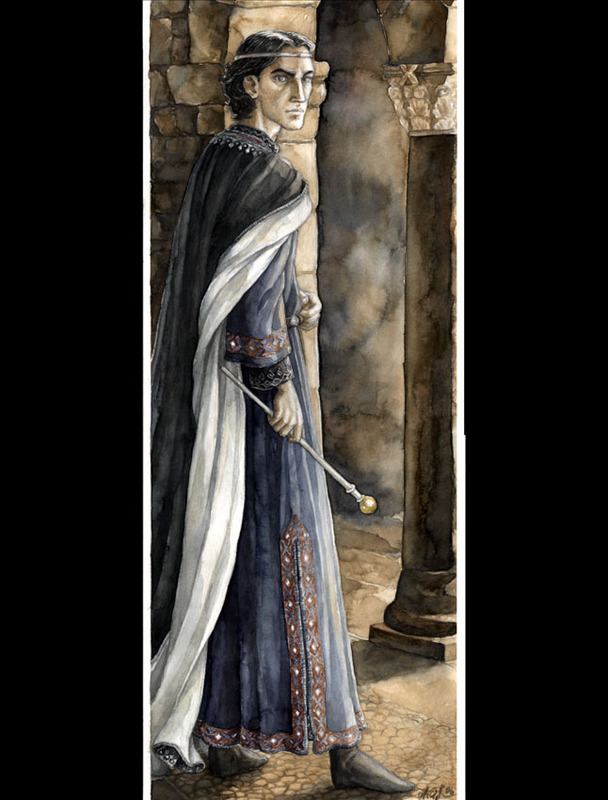 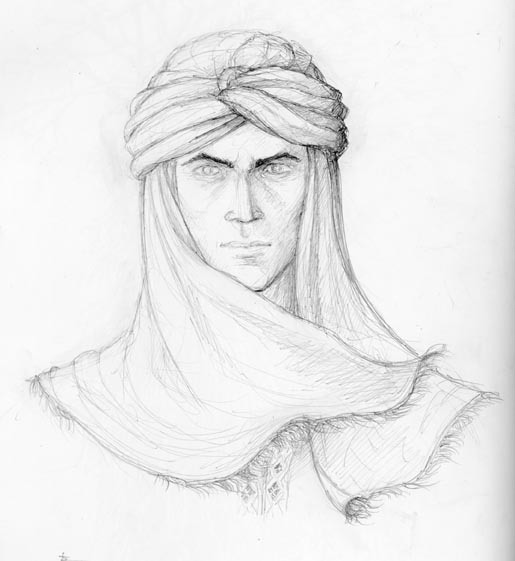 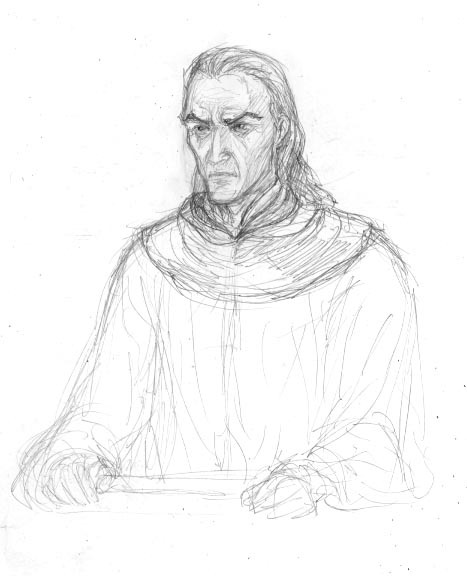 He is one of my RP-characters at www.tolkienonline.com: a Black Númenorean, originally invented as an enemy of Faramir, but eventually evolving into his friend. Composition sketches for scenes from LotR, book 3. 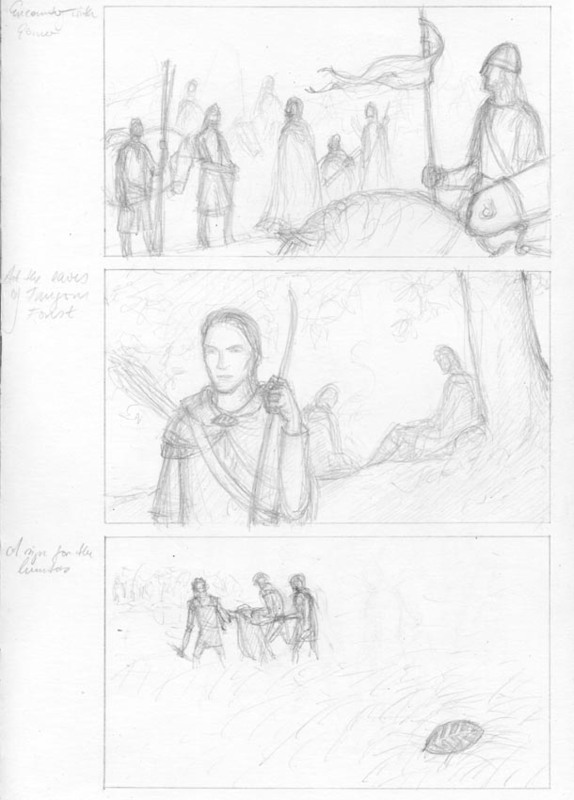 None of the scenes I have actually painted yet. Sketch for Your son has returned, lord... , from 1999. 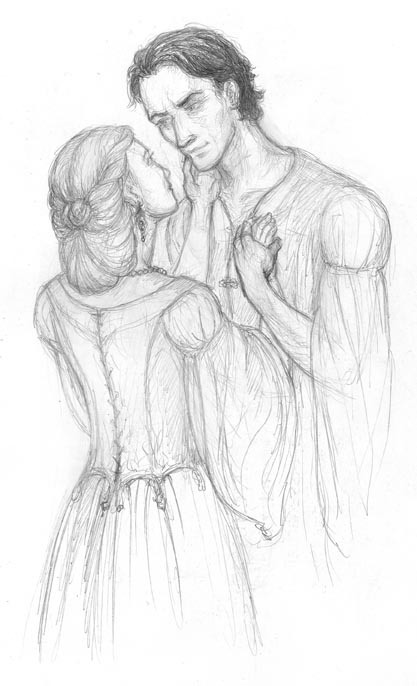 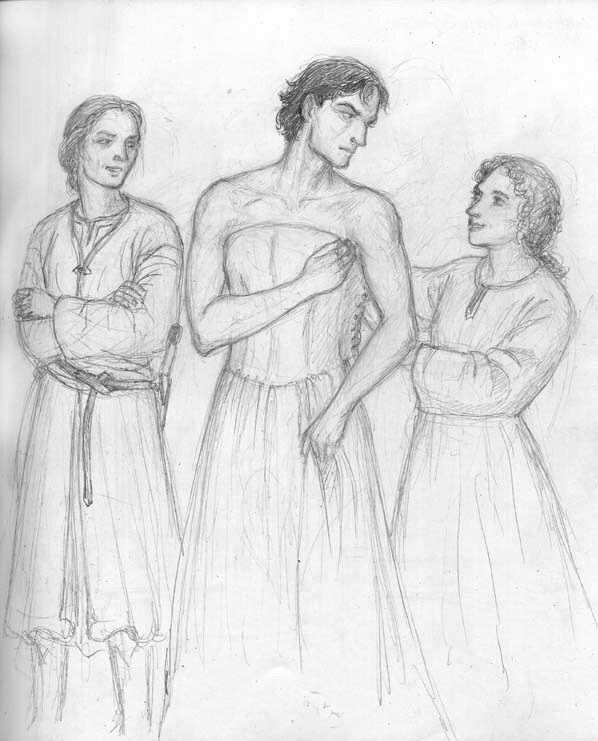 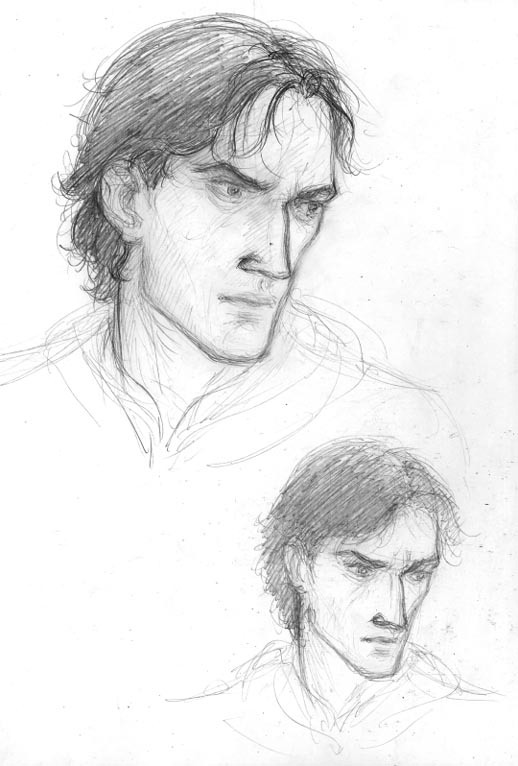 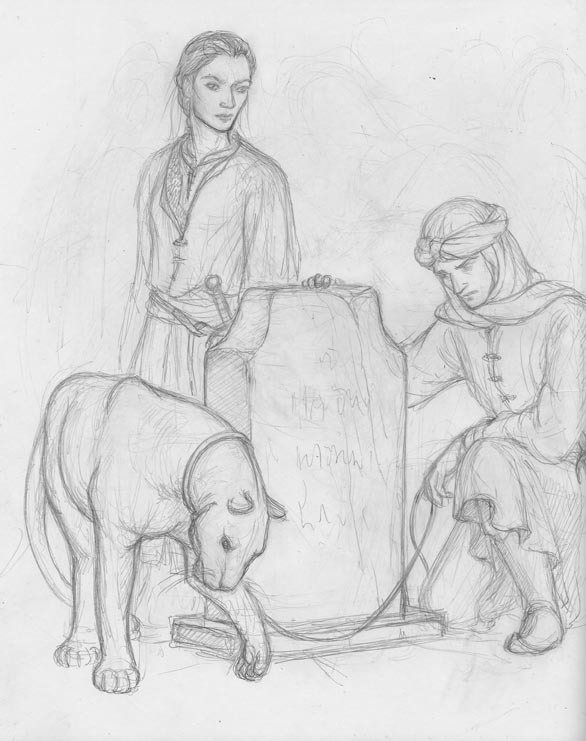 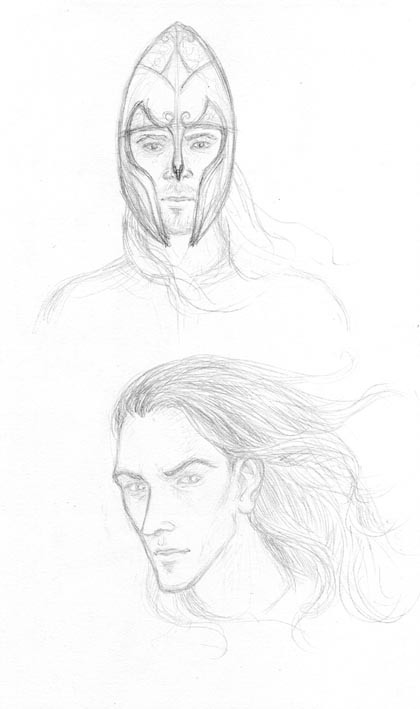 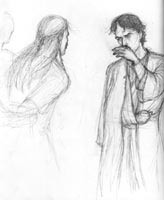 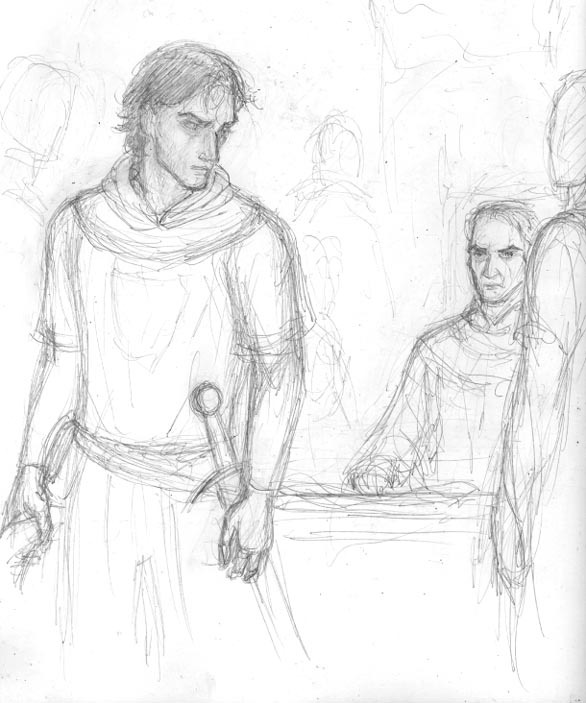 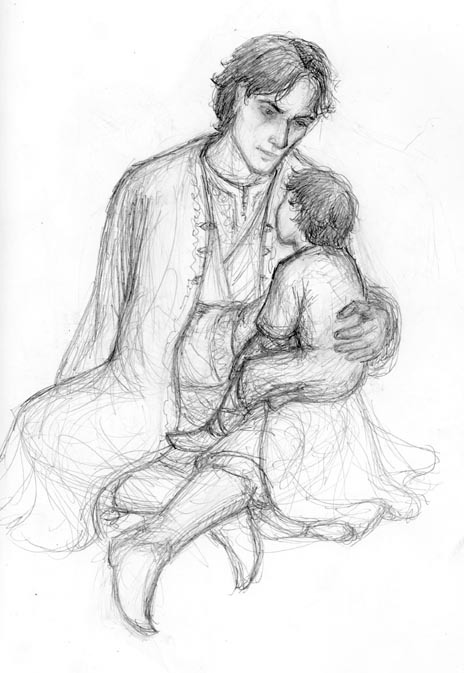 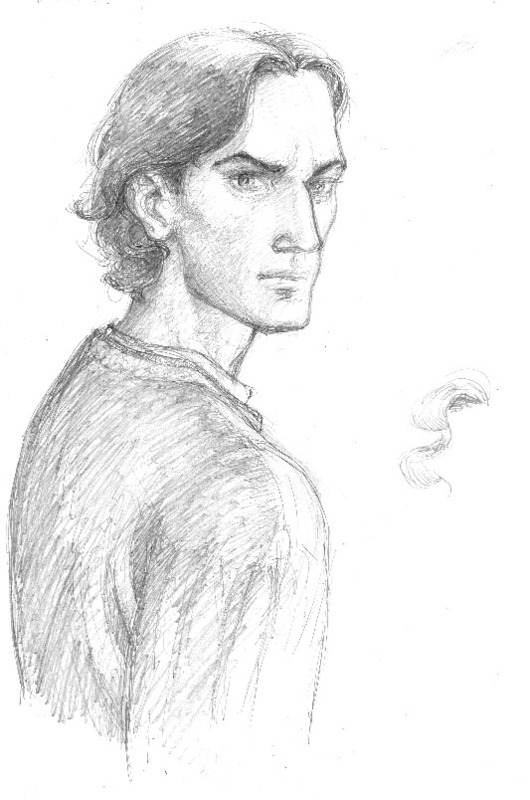 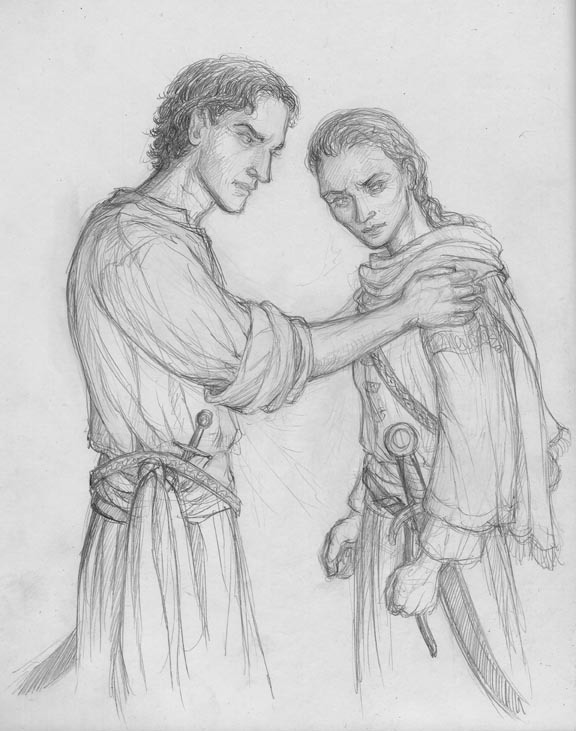 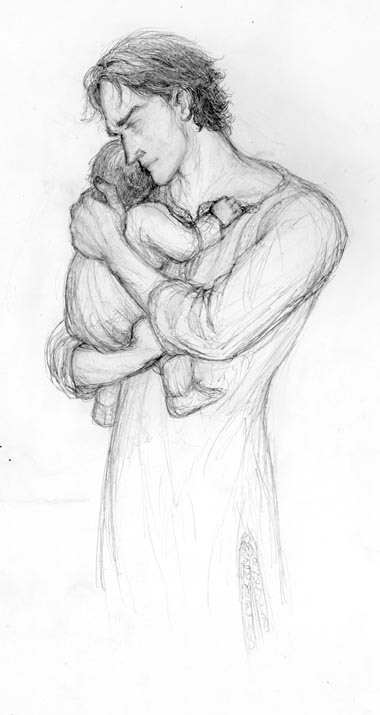 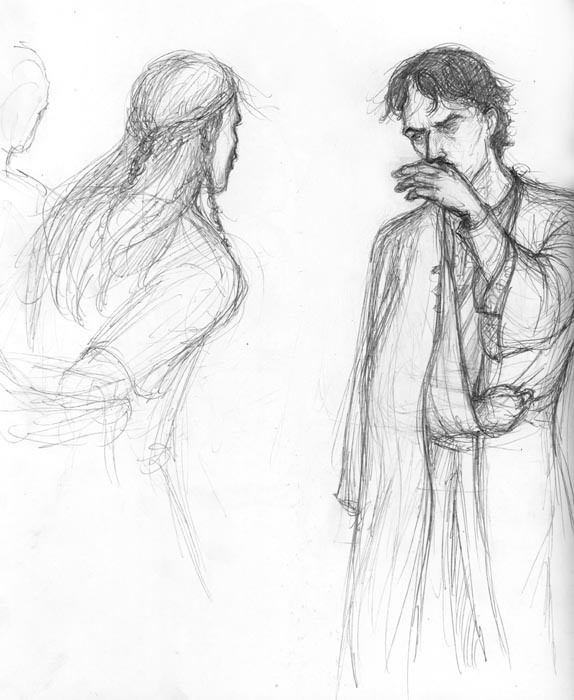 Sketches of Tuor and Voronwë for the Tuor-series. 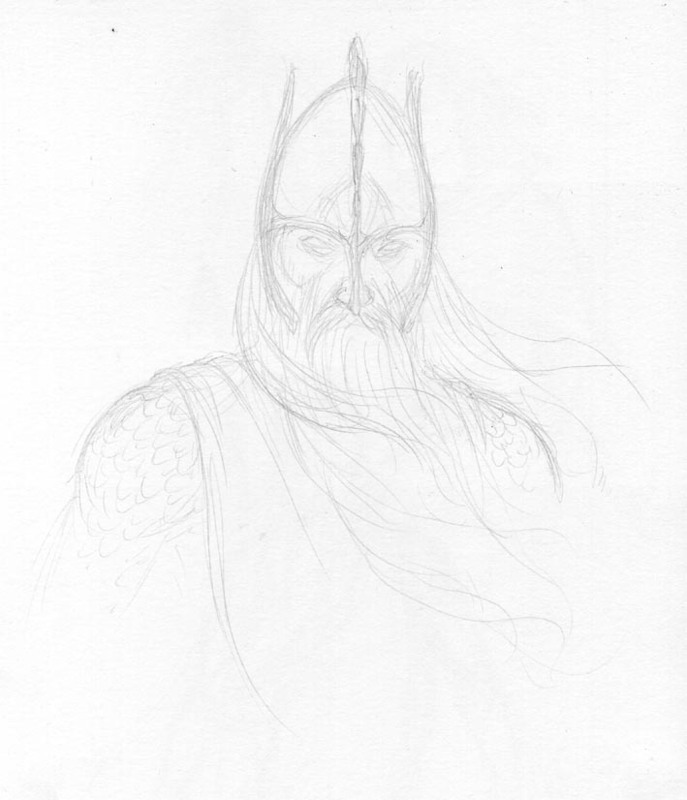 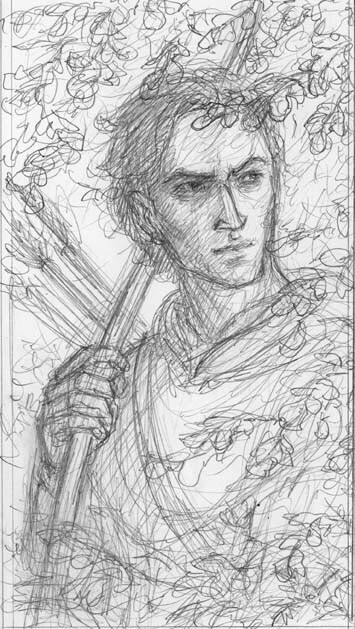 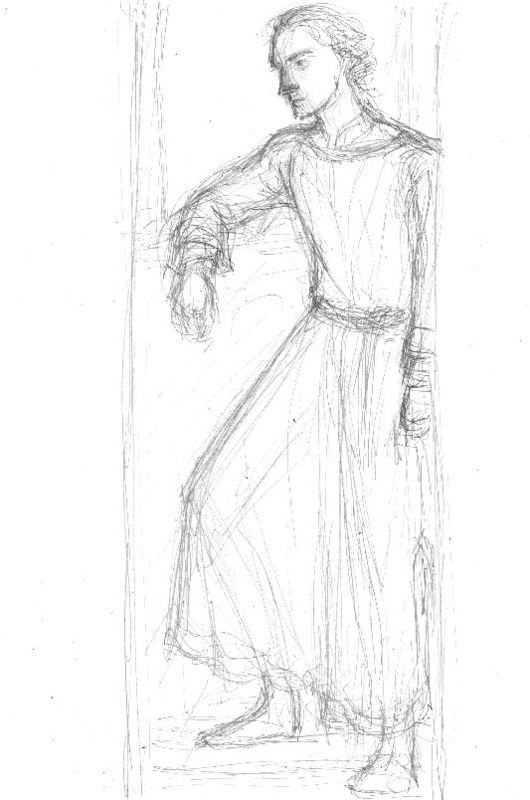 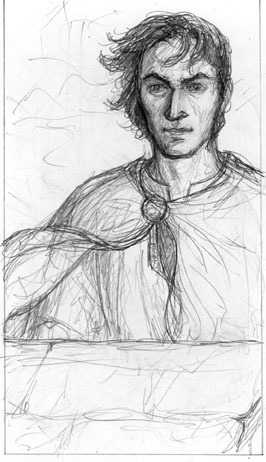 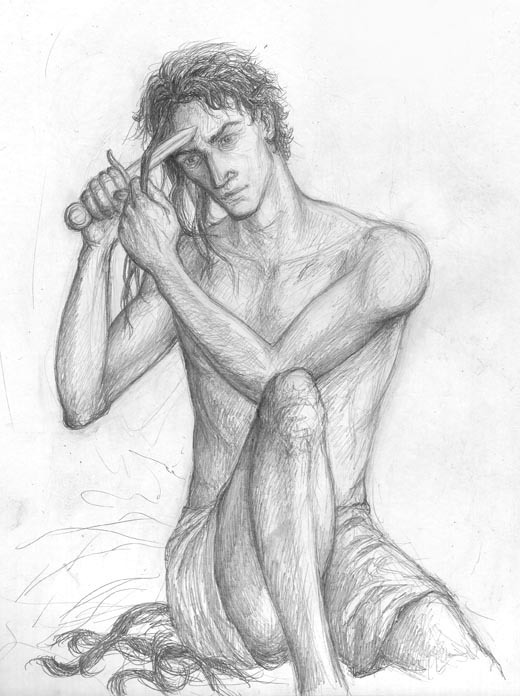 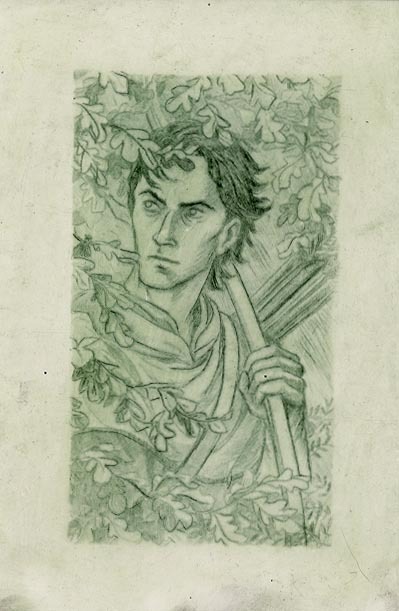 Sketch for Voronwë to determine his pose. 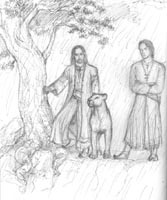 This is how he looks in the finished painting, entitled Tuor and Voronwë . 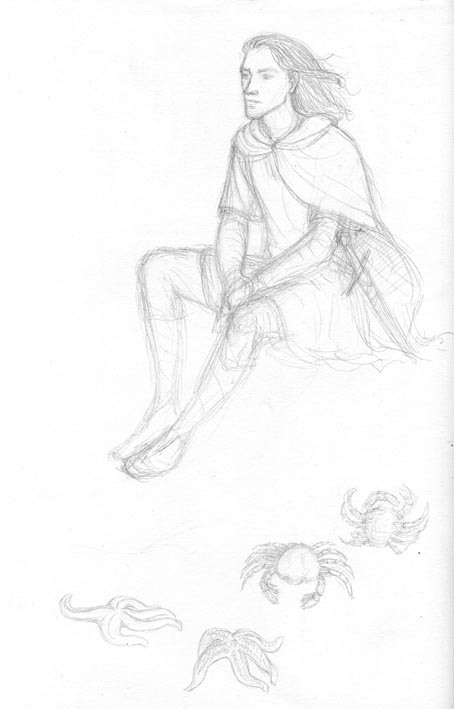 The crab and the starfish reappear there as well.